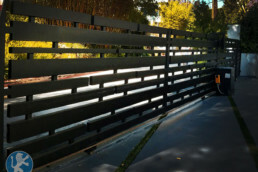 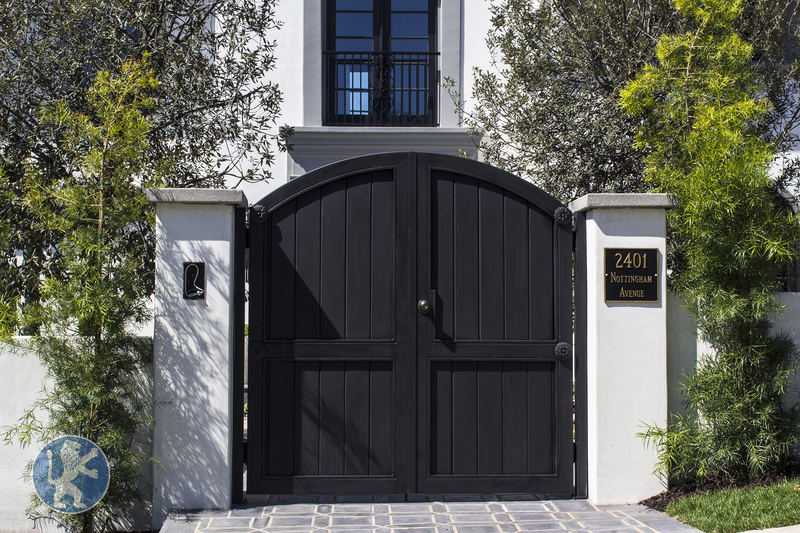 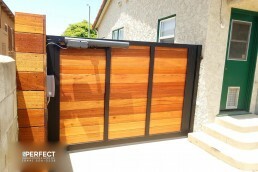 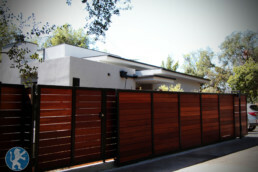 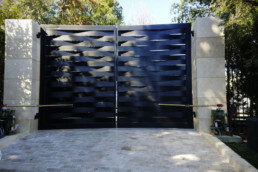 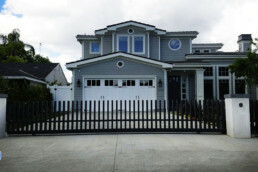 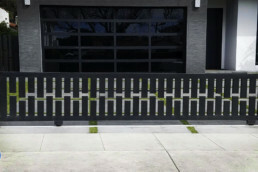 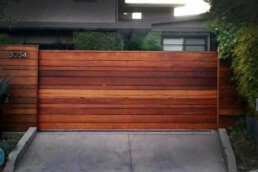 Driveway Gates - Perfect Garage Doors & Gates, Inc.
Gallery | Modern, Traditional, & Custom designs. 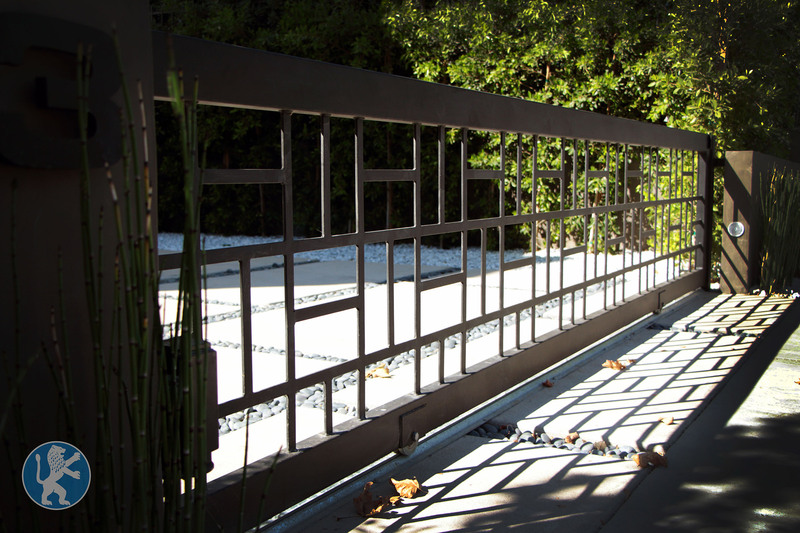 Made in a variety of materials, from Iron, Stainless Steel, Wood and Glass. 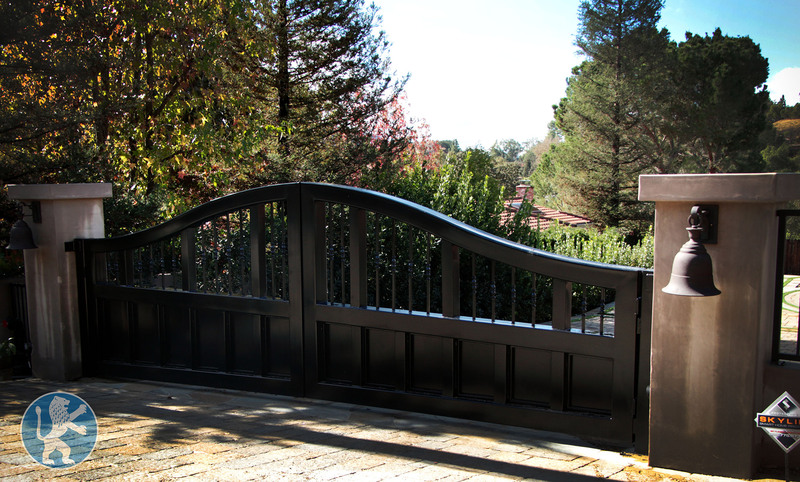 We offer everything from modern designs to more classic designs. 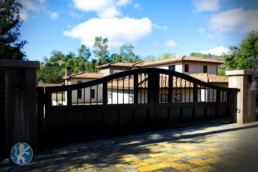 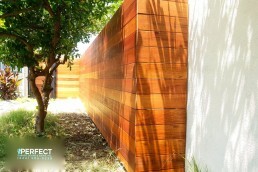 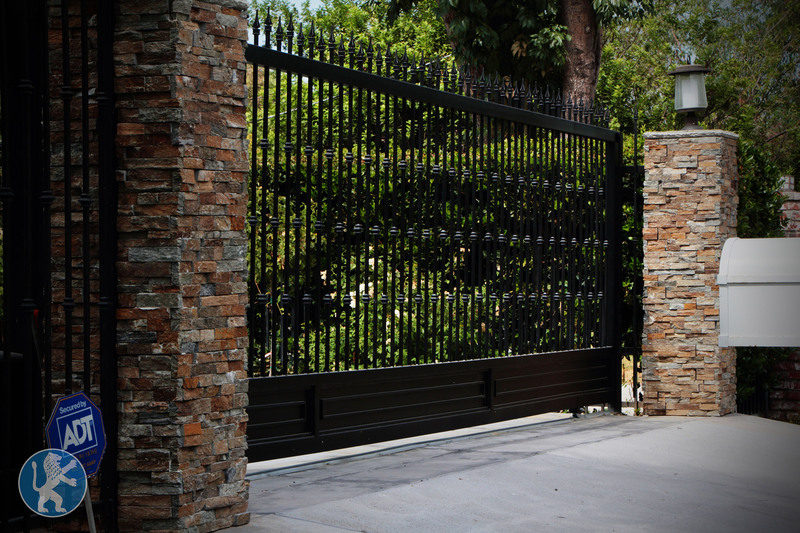 Your driveway gate can be as unique and beautiful as you want it to be, the sky is the limit for our designers. 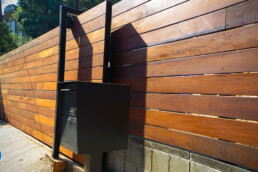 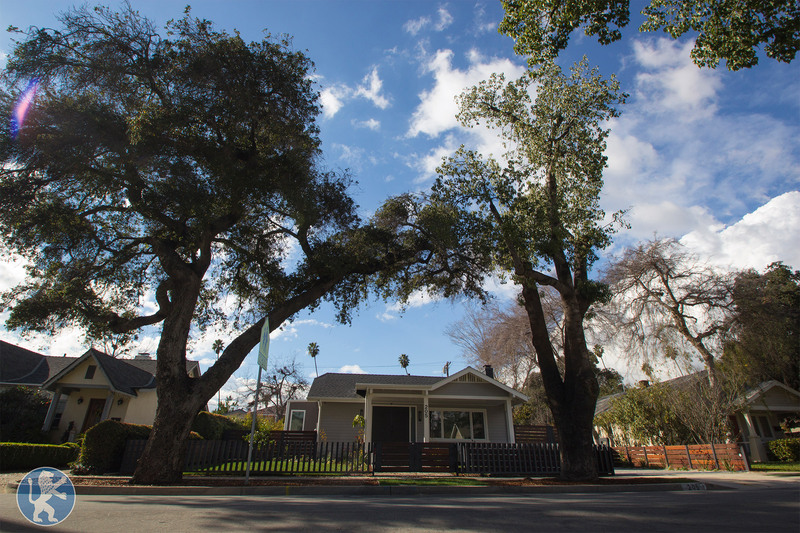 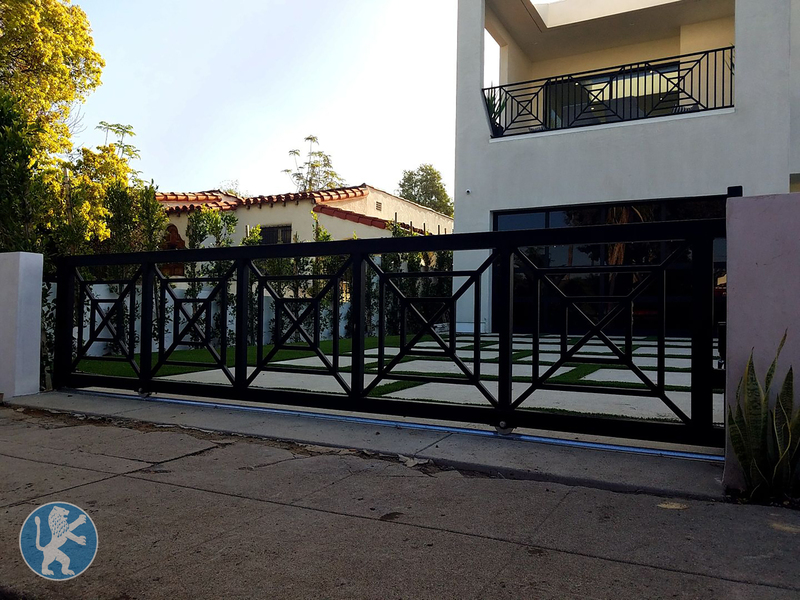 With over 20 years of landscape and home design in the Los Angeles area, they are knowable of the latest trends and what has stood the test of time in terms of home design. 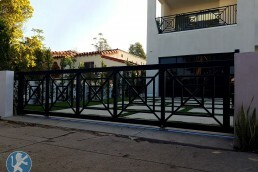 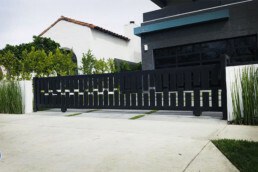 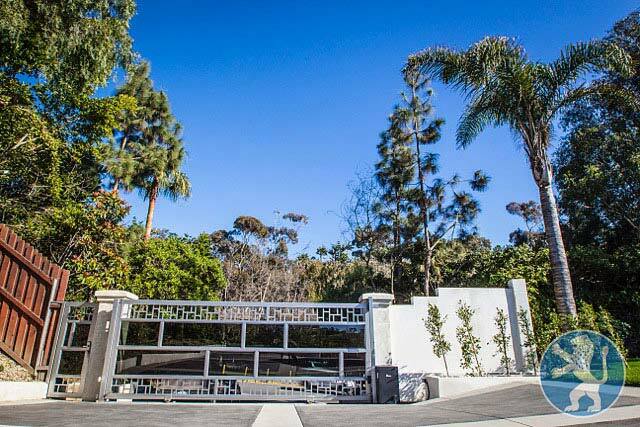 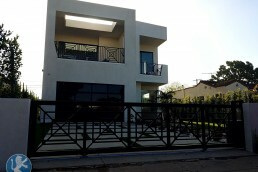 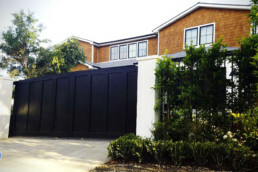 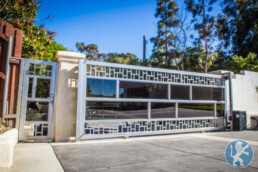 Decorative Iron Gate on PCH the first custom iron gate to use black tinted glass in the area. 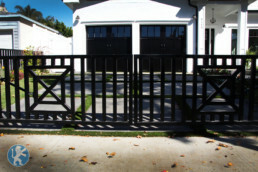 Black Powder Coated Iron Gate with Clear Glass in the center. 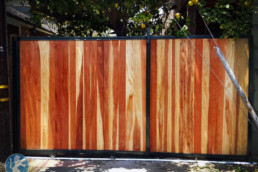 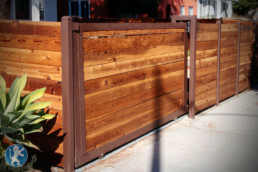 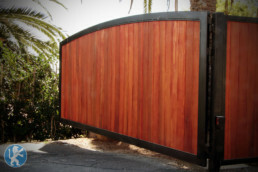 Manual Swing Wooden Driveway gate with metal frame and redwood in the center. 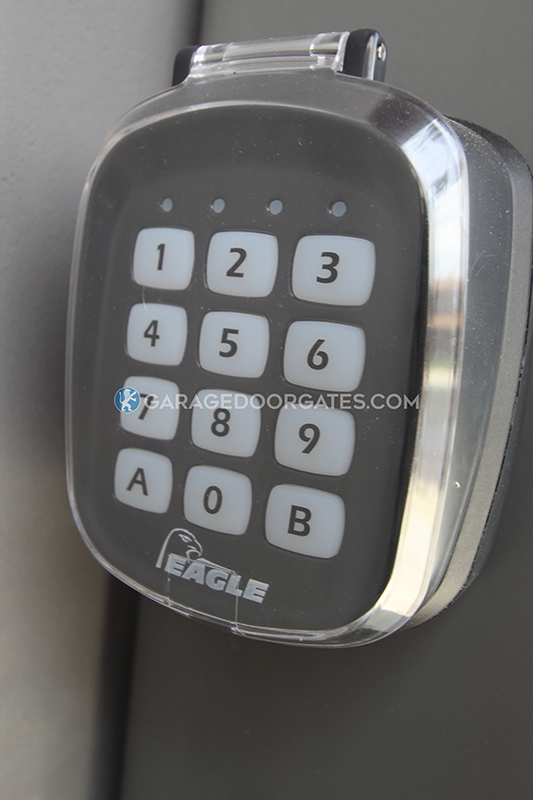 Heavy Duty Hinges and Dead Bolt Lock. 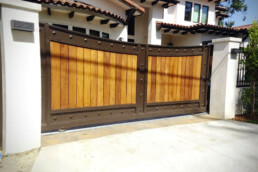 Spanish style solid wooden automatic gate. Redwood and stained with a clear coat for extra protection. 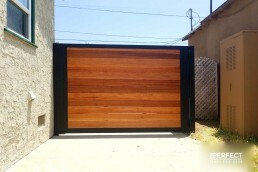 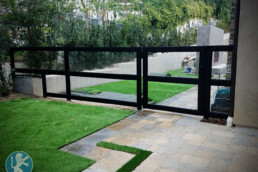 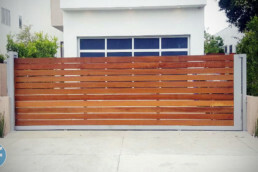 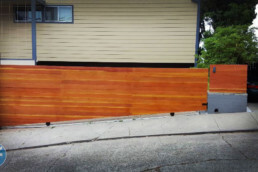 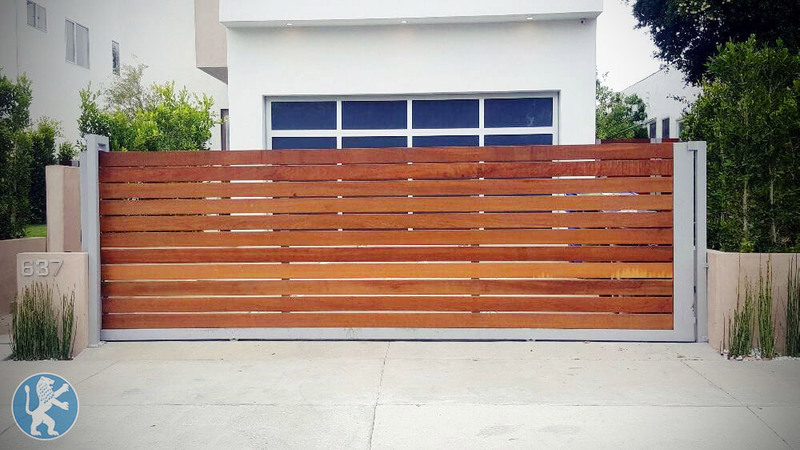 Sliding Custom Redwood and Iron Automatic Gate. 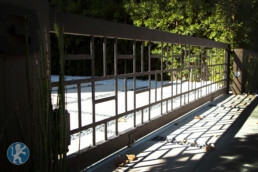 Galvanized V Track and Primer and Paint for the metal Frame and Post. 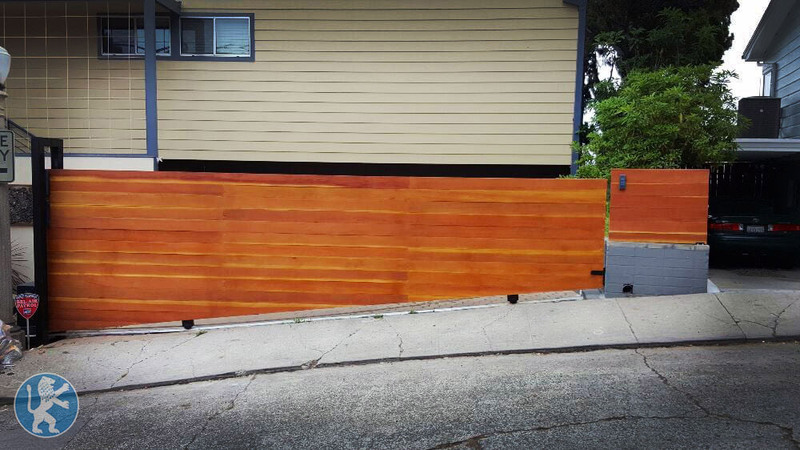 Redwood has been stained with a clear coat for extra protection. 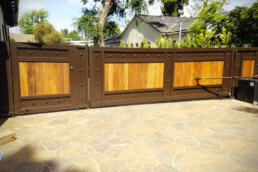 Custom swing gate made of Vertical solid bottom redwood painted as per the customer’s preference. 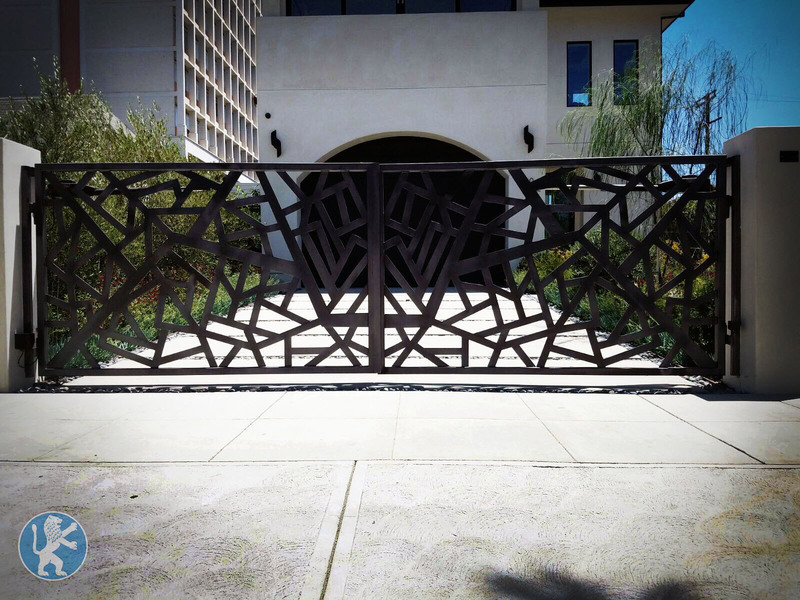 The top foot is iron. 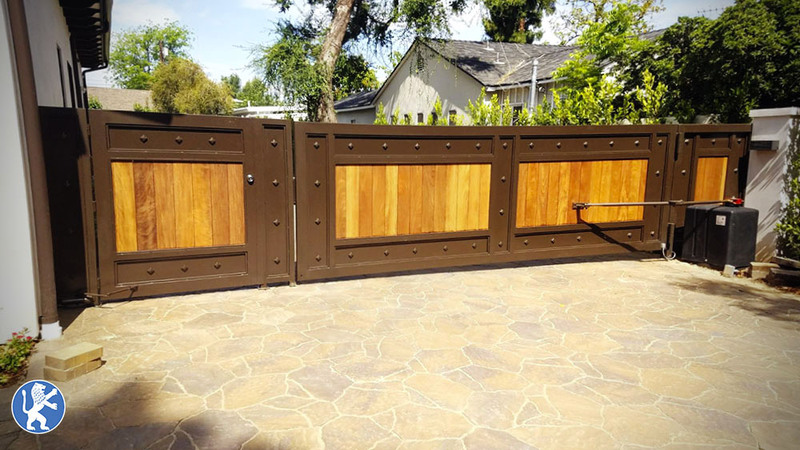 Redwood driveway gate with a tongue in groove horizontal design on a slope. 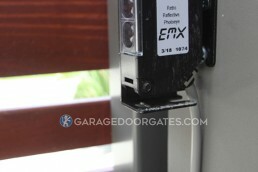 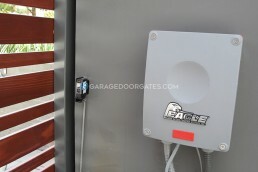 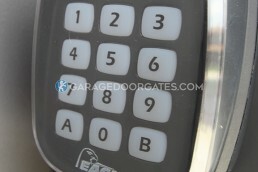 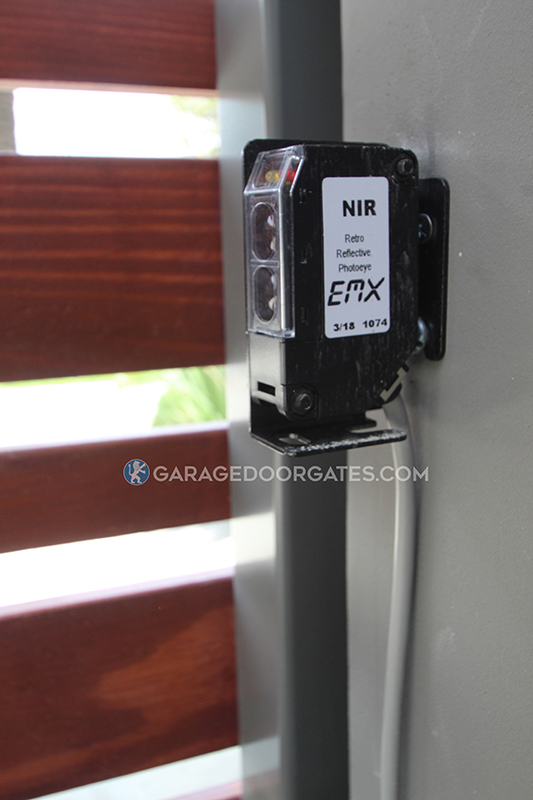 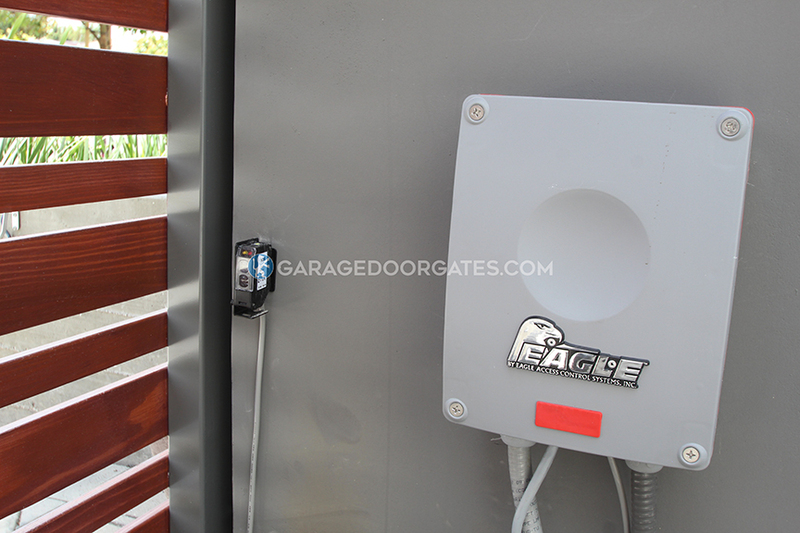 Automatic Electric Gate Opener with new galvanized V Track. 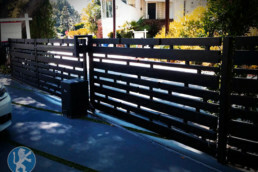 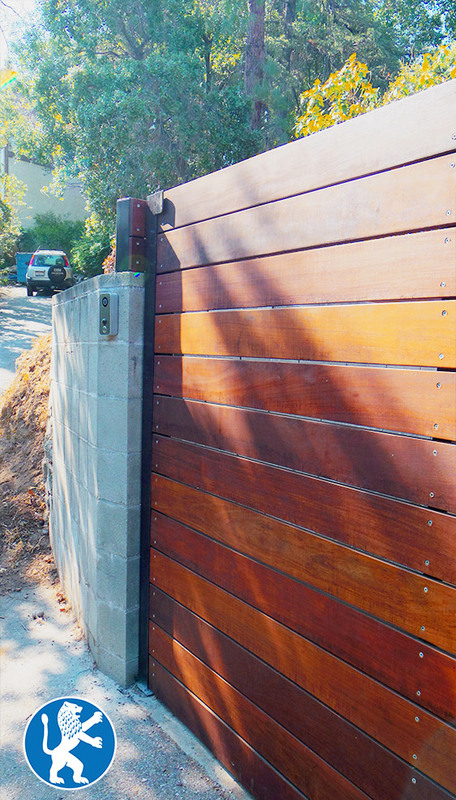 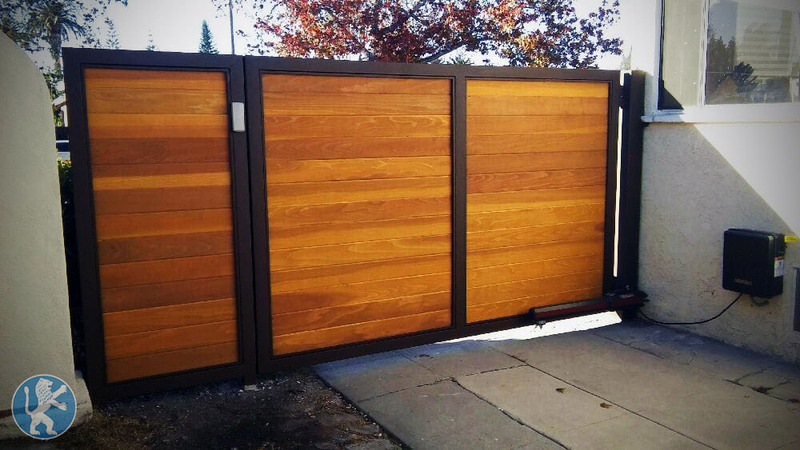 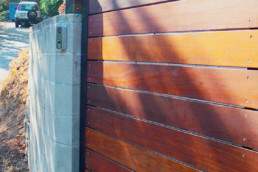 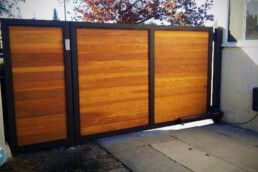 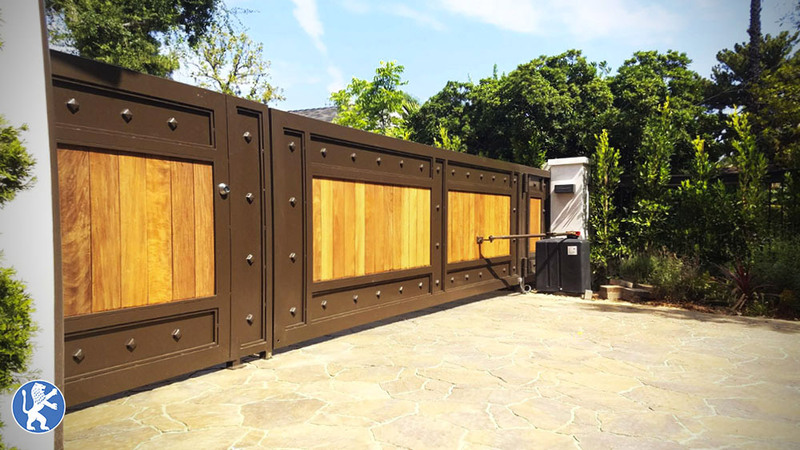 Redwood Driveway Swing Gate with LA500 Operator, Heavy Duty Hinges and a wireless keypad. 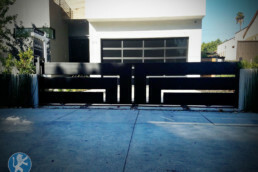 The Iron frame and post have been powder coated in a matte black color. 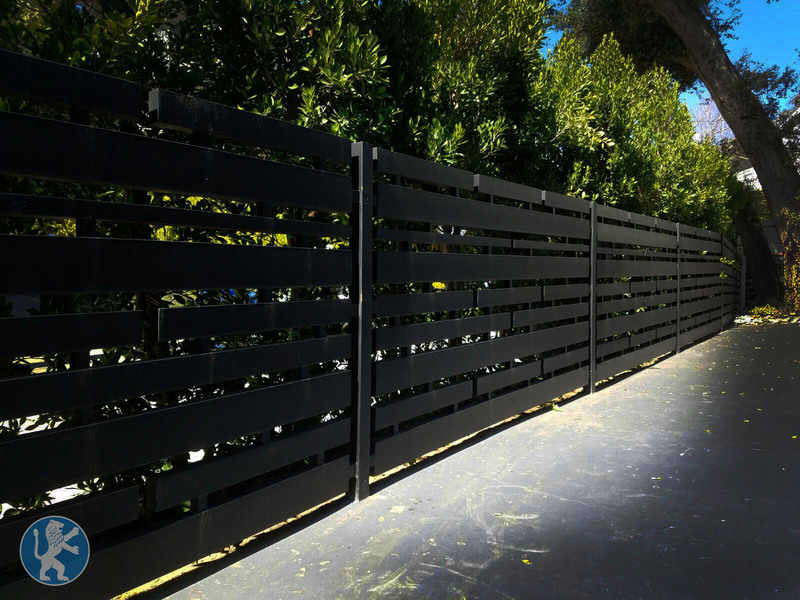 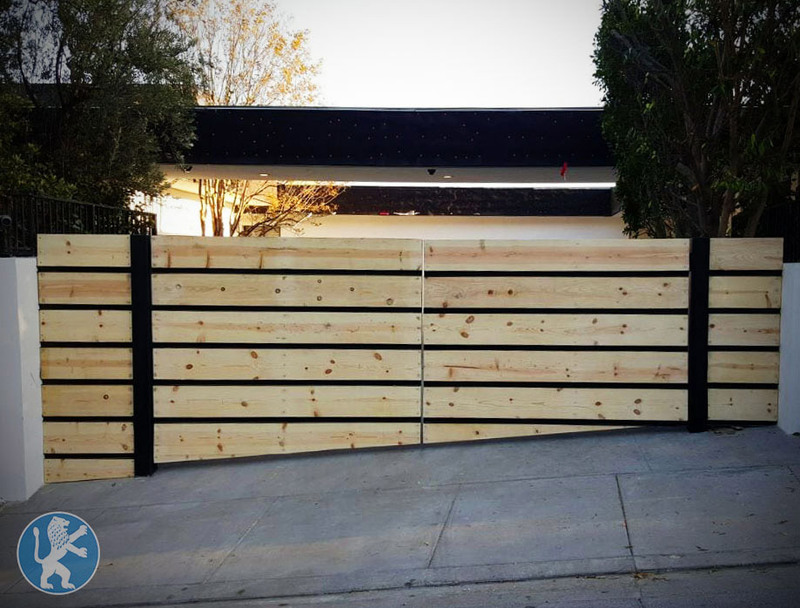 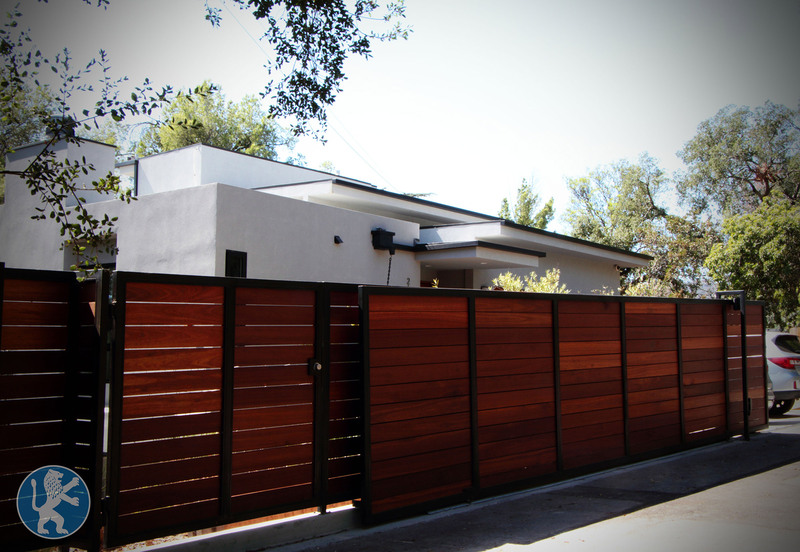 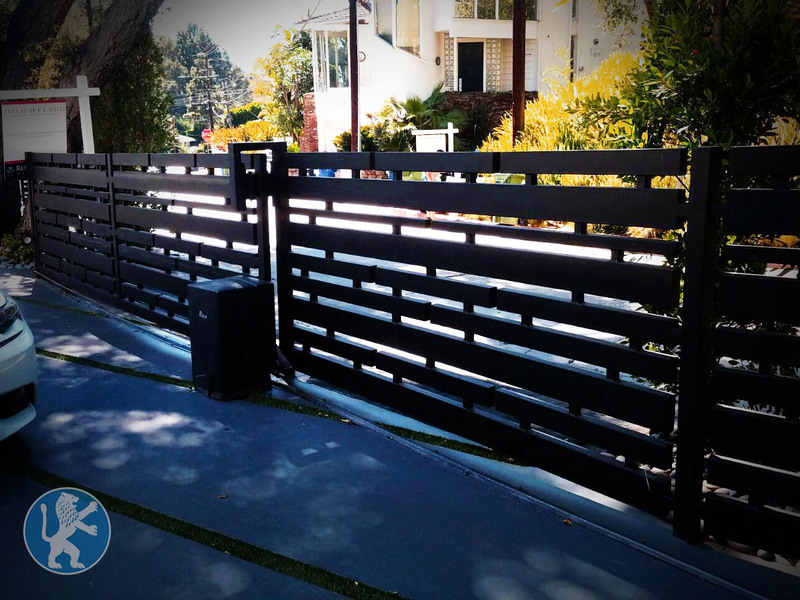 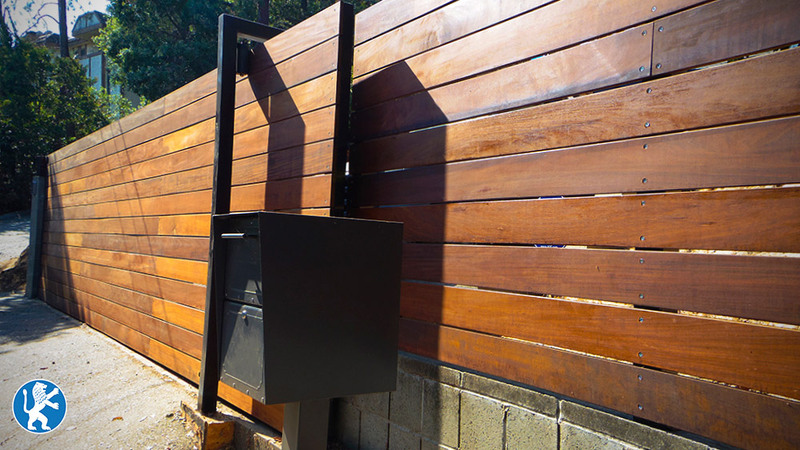 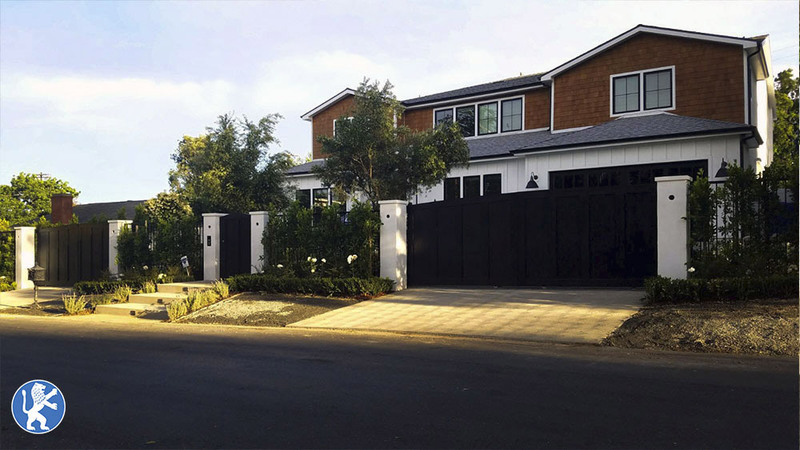 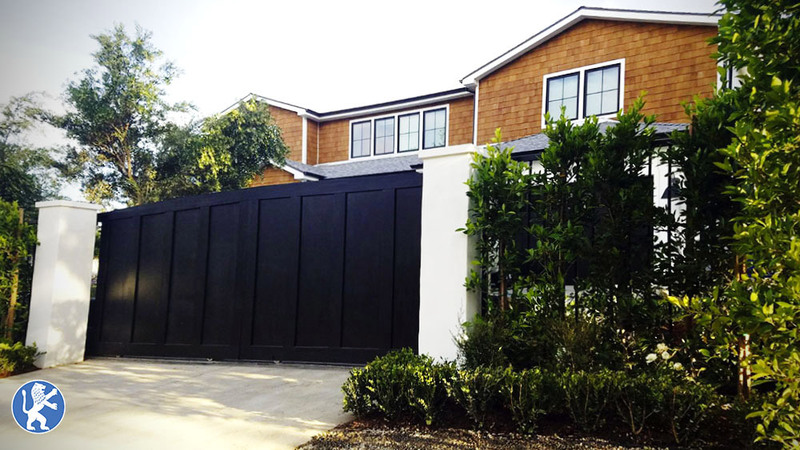 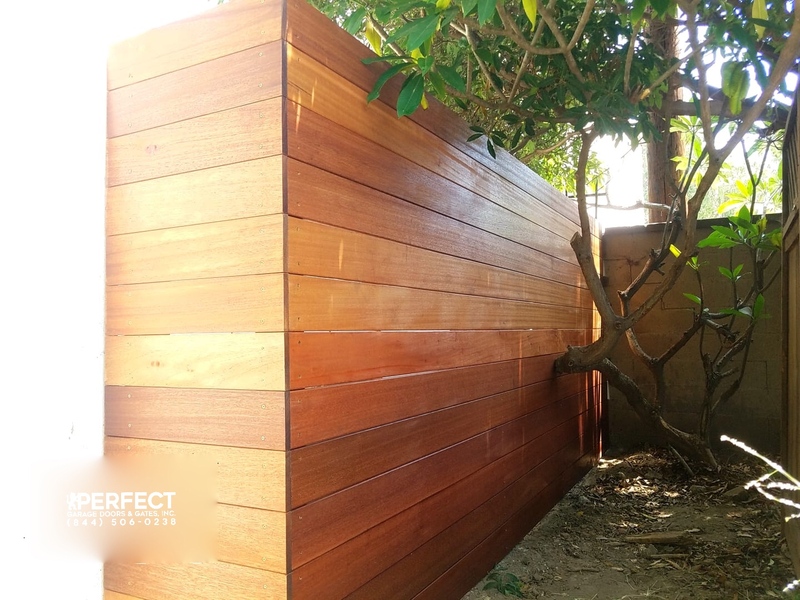 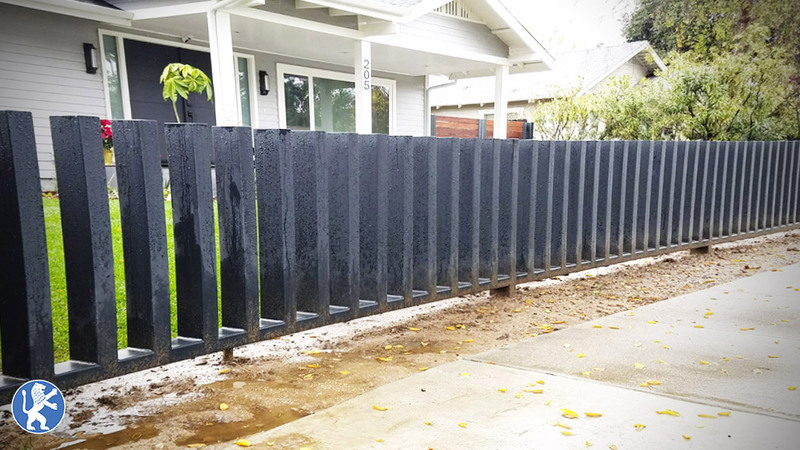 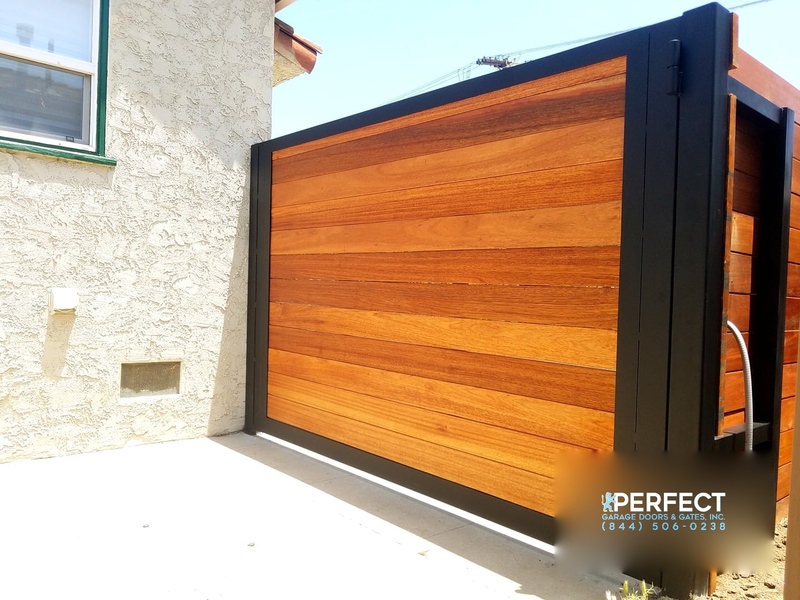 Custom Cedarwood Sliding gate on a slope with steel posts and frame in black to add to the striking contrast for this beautiful home. 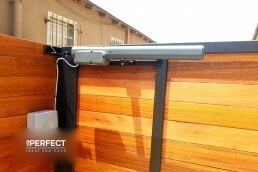 Redwood horizontal sliding automatic gate with galvanized v track and heavy duty power wheel. 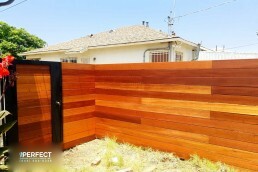 Clear coat stain for extra protection. 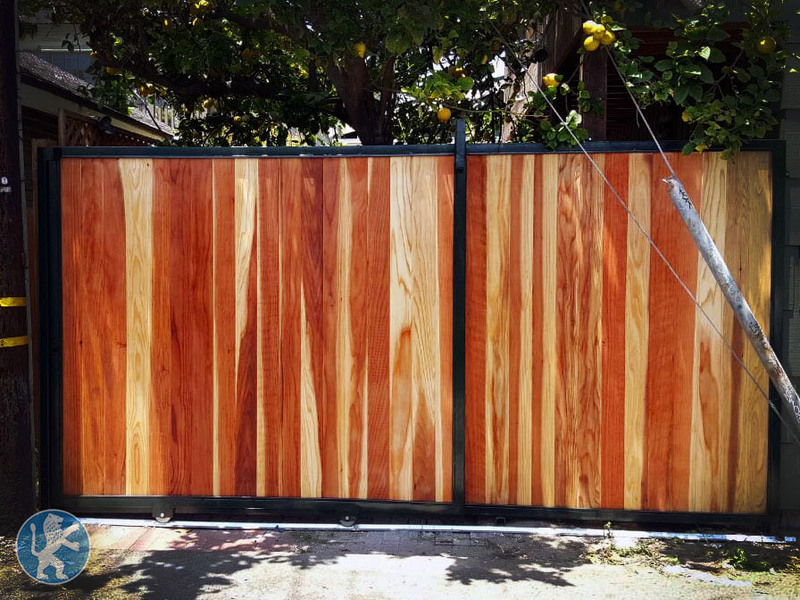 Solid style Vertical Redwood Swing Gate, complete with heavy duty hinges, with Lock and Painted as per the client’s preference. 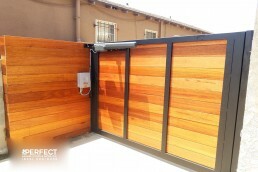 Solid look for privacy and extra security. 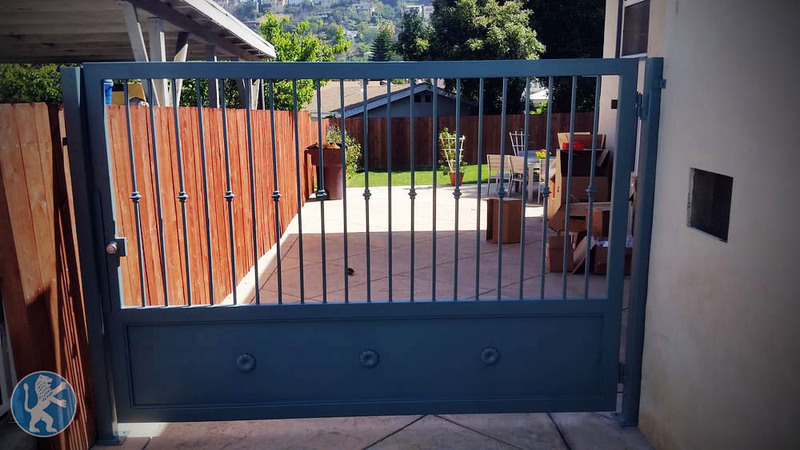 Ranch Style Iron Swinging Gate. 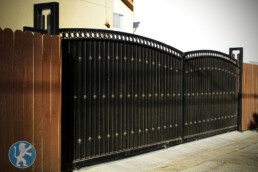 Solid botton design with mix of heavy and lighter bars on top, topped with a decorative arch. 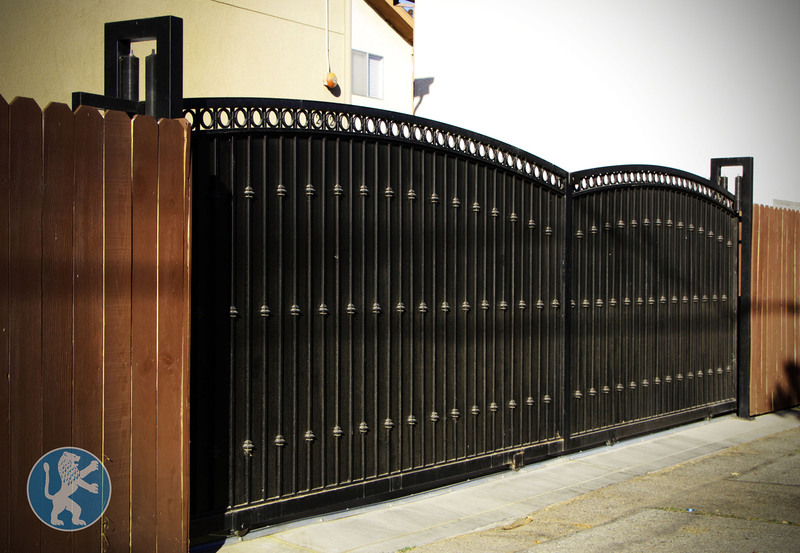 Solid design with decorative knuckle bar design topped with decorative circles on top with arch. 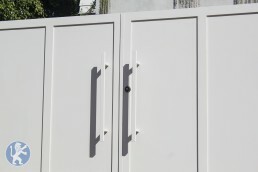 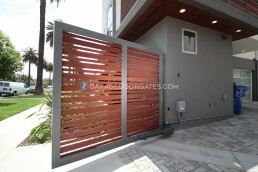 Solid design metal Sliding gate painted to match the customer preference. 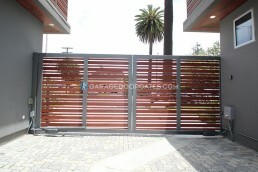 Solid style security sliding gate. 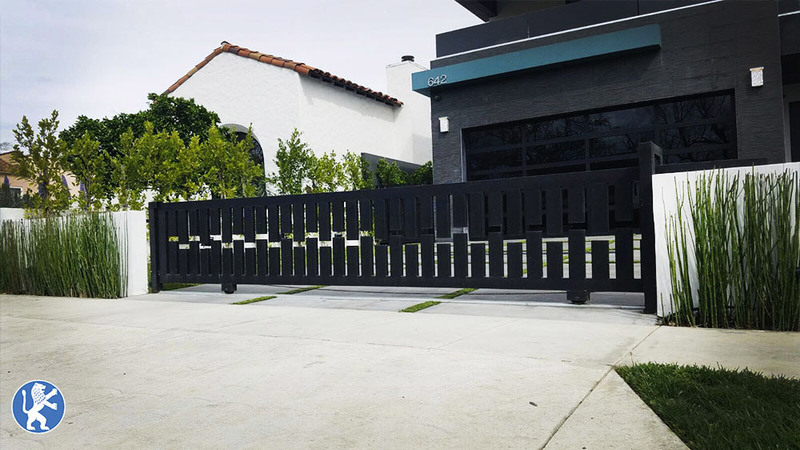 Solid Style security gate with wireless keypad and call box for entry. 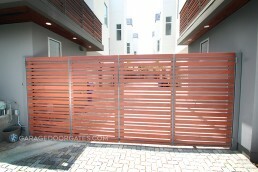 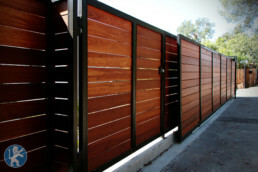 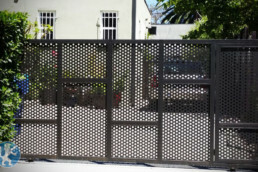 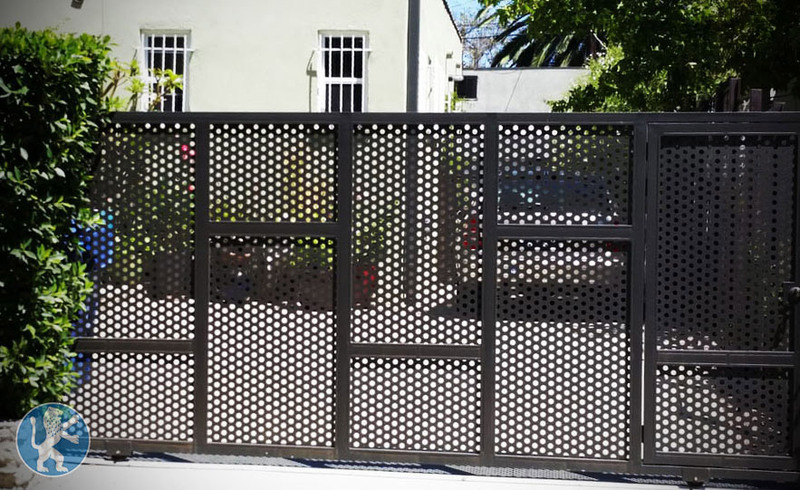 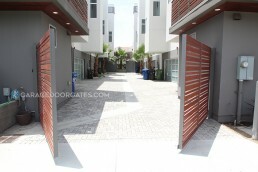 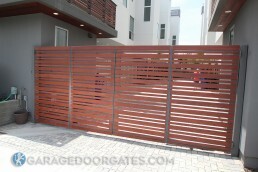 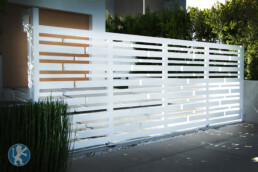 Modern Decorative style sliding gate. 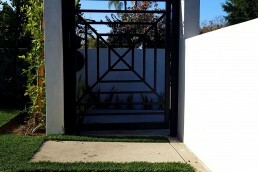 Modern custom design in the center that is both functional and stylish. 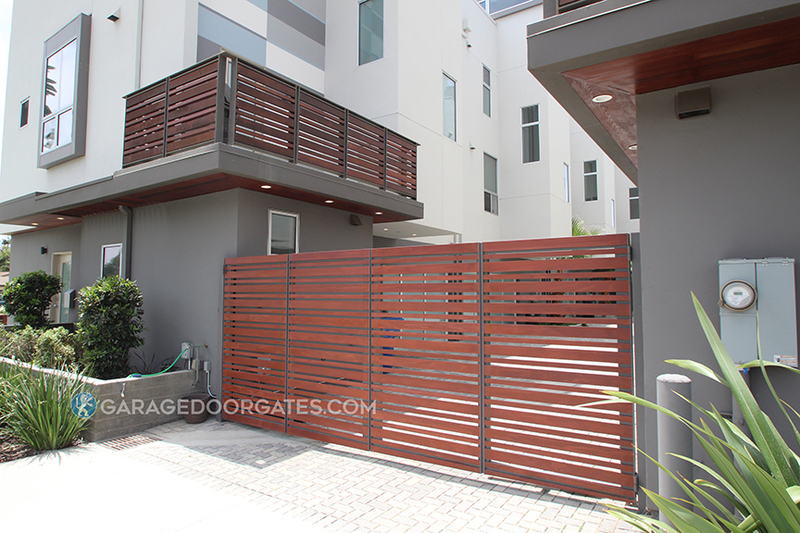 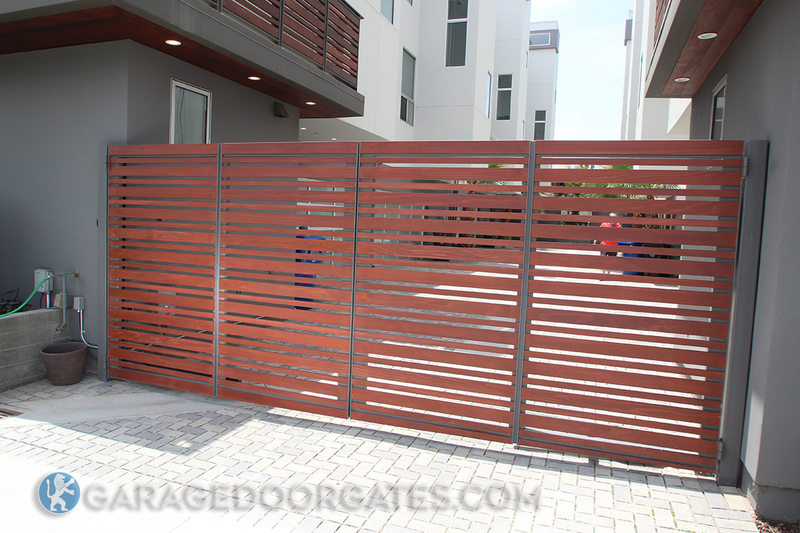 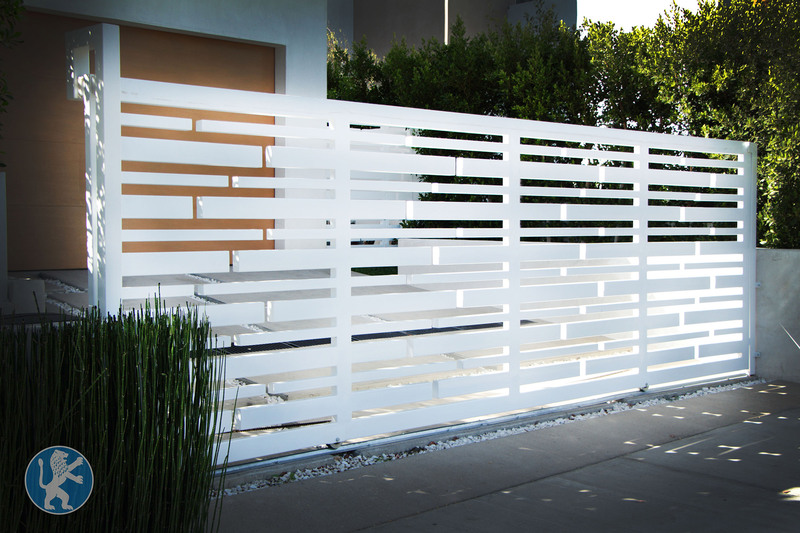 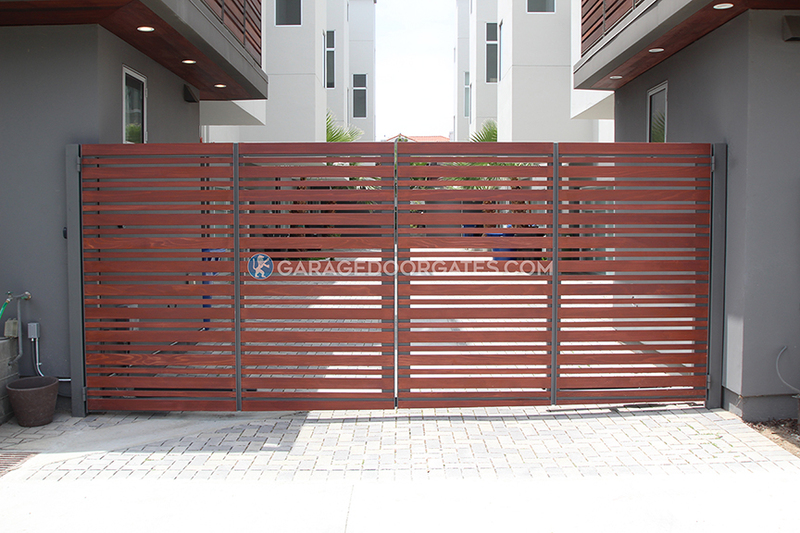 Modern Design Iron Sliding Gate with alternating size bars for a clean modern look. 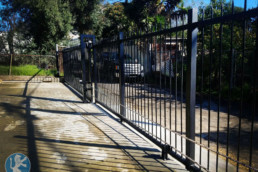 Galvanized V Track and Heavy Duty Power Wheel make this automatic gate complete. 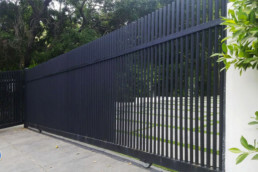 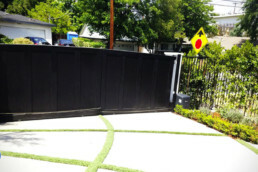 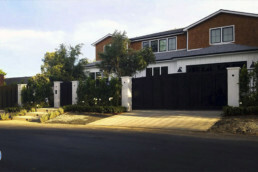 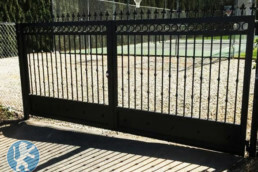 Standard design security sliding driveway gate. 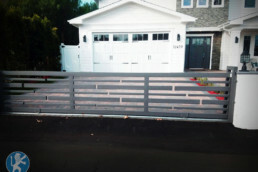 Spikes on top with a new galvanized v track and a heavy duty power wheel. 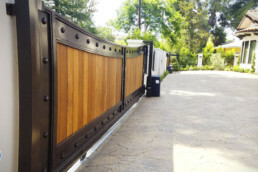 French Country Style Iron Driveway Sliding Gate. 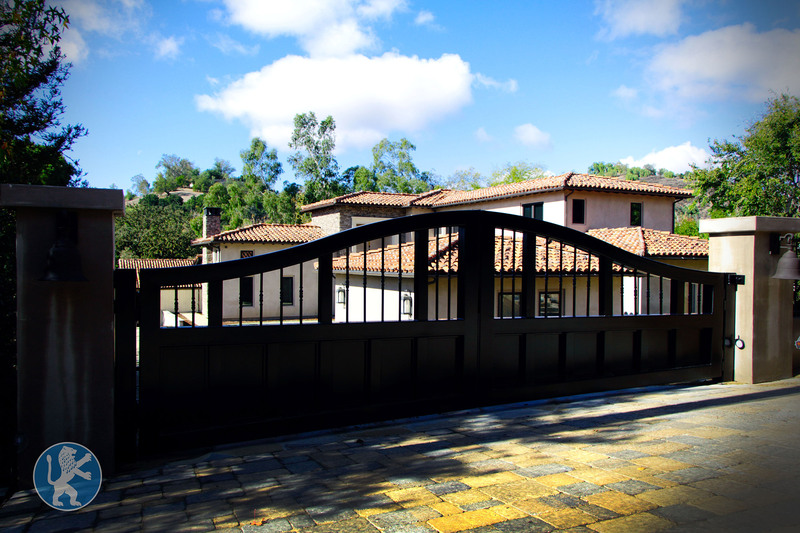 Custom Design to match the homes exterior. 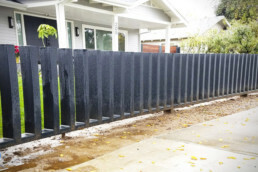 Powder coating in a black color to be a lovely contrast to the brightness of the home. Decorative wrought iron gate with ornamental rings on top with security spikes. 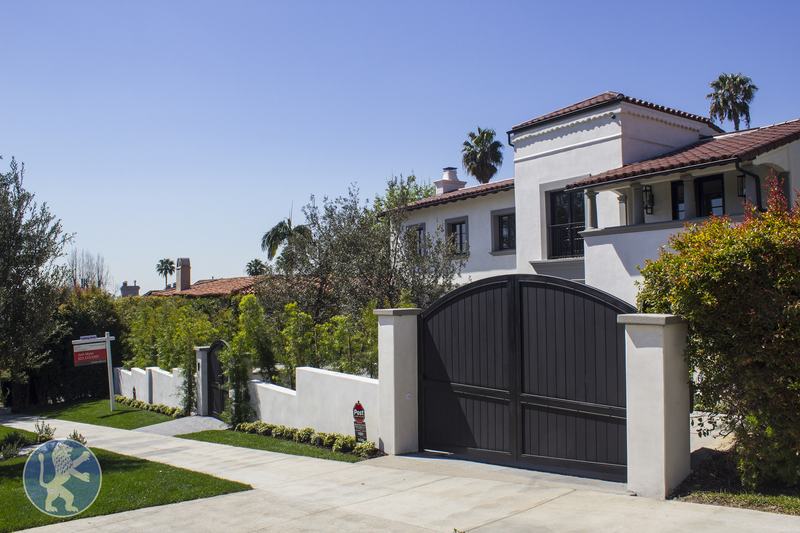 Traditional and timeless. 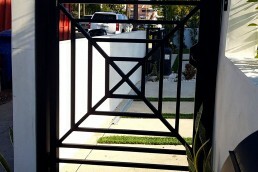 Custom Iron Swing Gate with clear glass in the center. 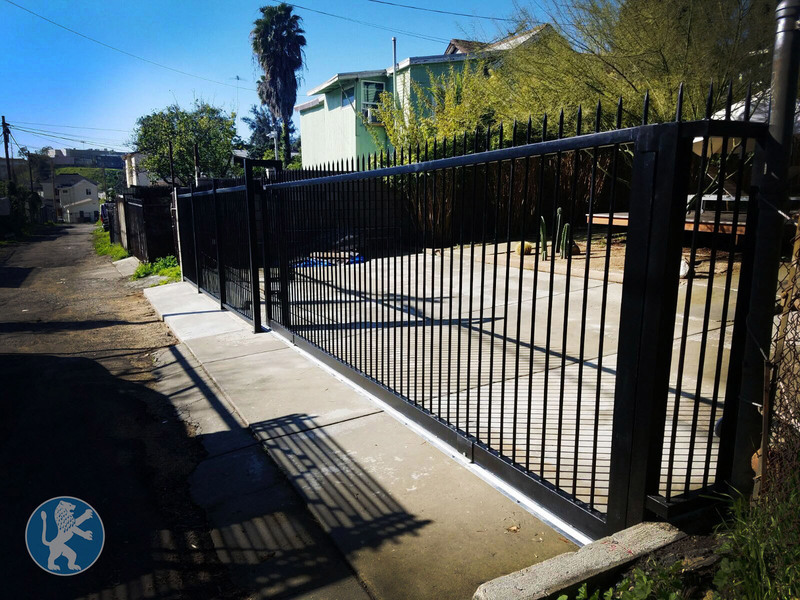 Custom Swing Wrought Iron Gate with Solid bottom foot and security bar with decorative knuckle design. 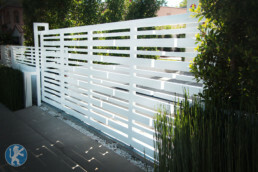 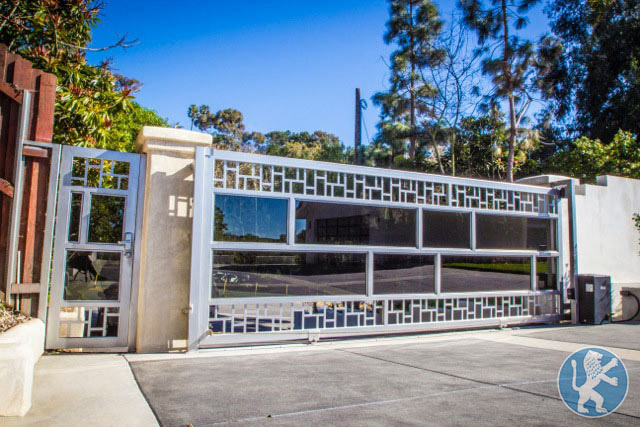 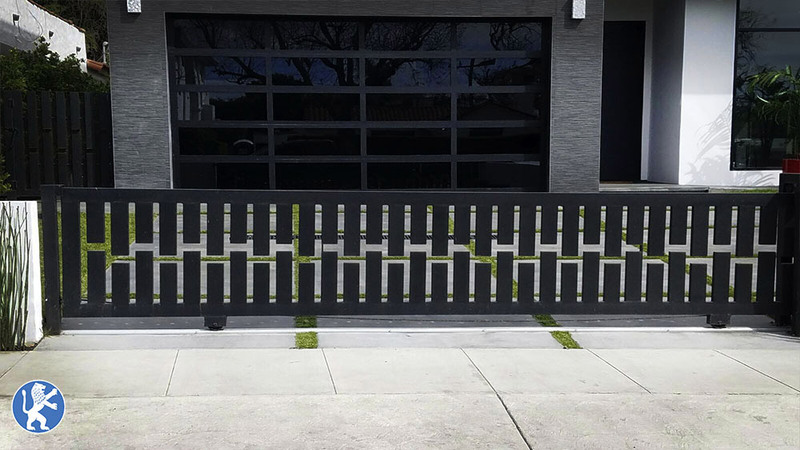 Modern Art Deco Twist on this beautiful sliding gate. Powder coated to match the clean lines of the home it belongs to. 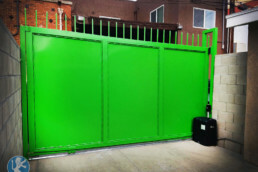 Bright and Green this security gate makes everyone smile. 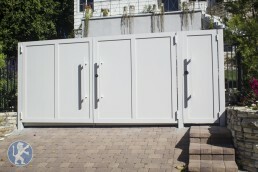 Solid with spikes on top, equipped with a LA 500 1/2 hp operator to handle everyday high traffic. 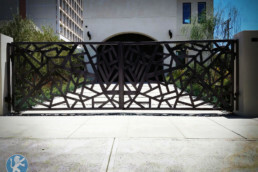 Modern Custom Swing gate with custom ornamental design. 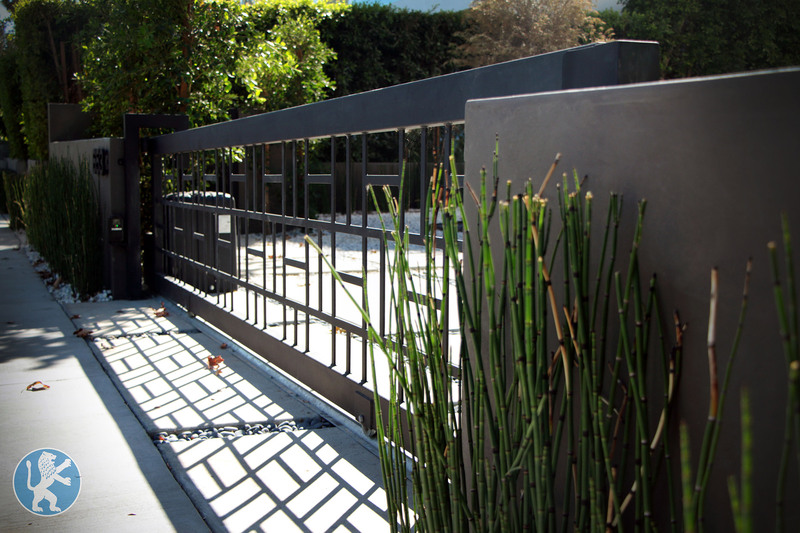 Powder Coated to match the other metal fixtures on the outside of the home. 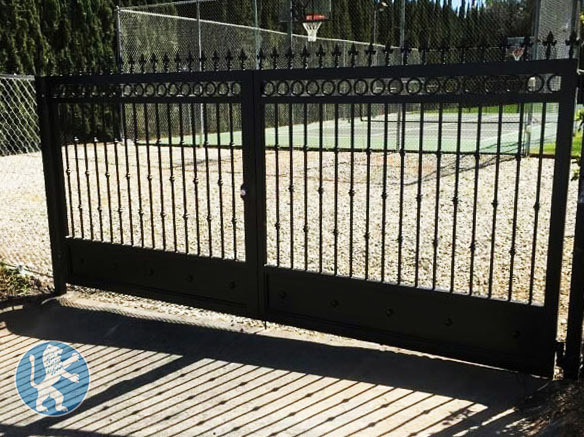 Wrought Iron Gate with 16 gauge security mesh backing, powder coated for easy maintenance. 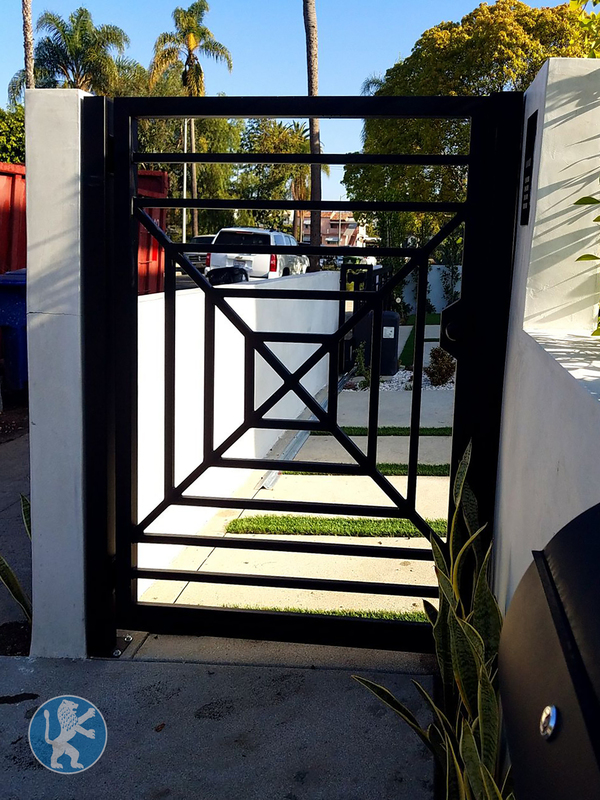 Custom Swing Wrought Iron Gate with Solid bottom foot and security bar with decorative knuckle design. 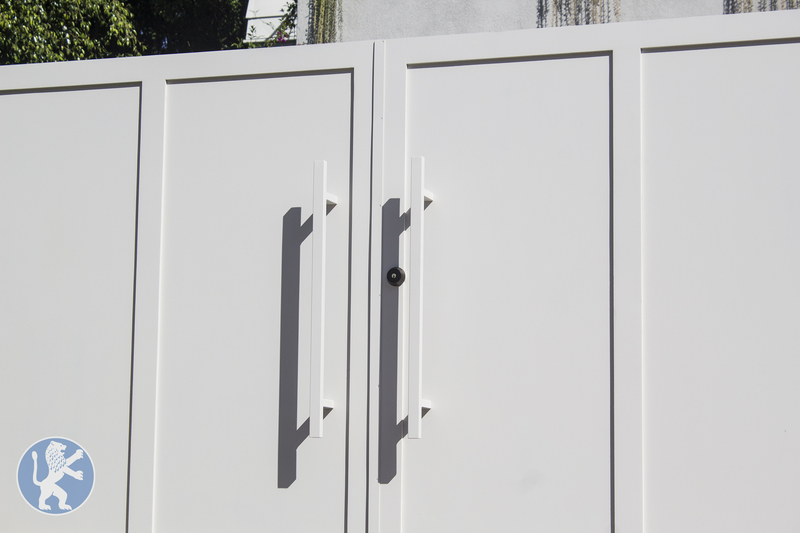 Heavy Duty Hinges and custom paint job. 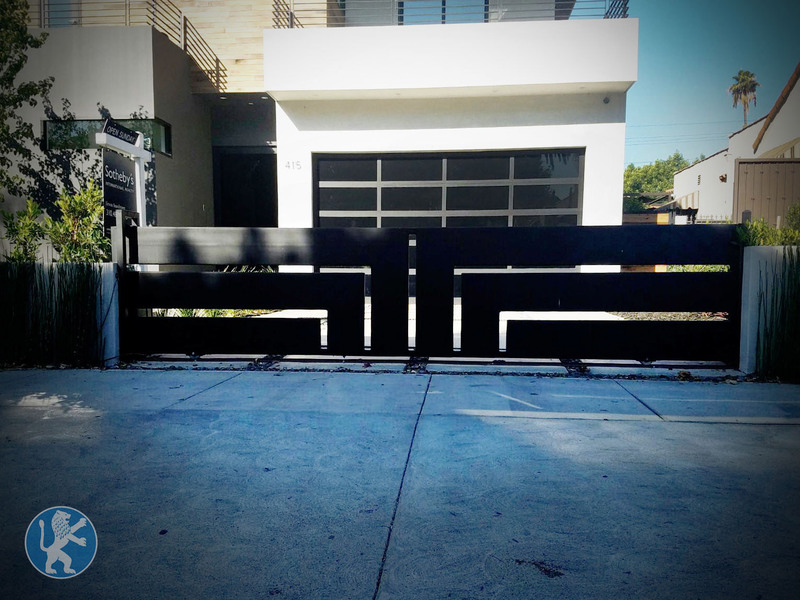 Vertical Design Modern Twist on a classic wrought iron sliding gate. 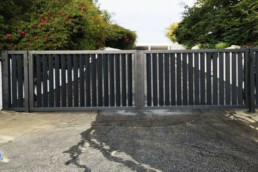 Modern Minimalistic Iron Driveway Gate powdercoated for extra durability. 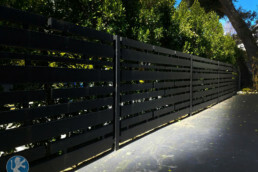 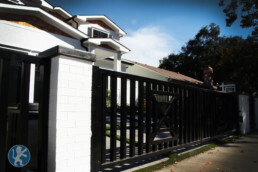 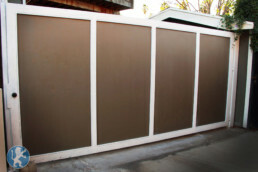 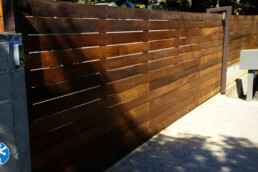 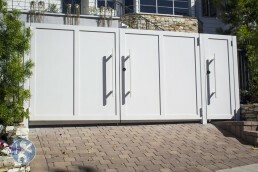 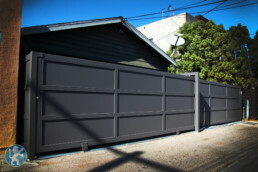 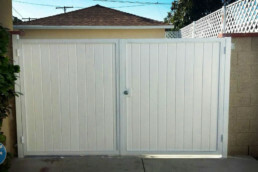 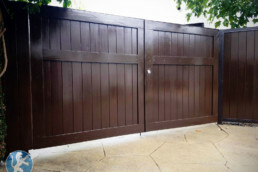 Driveway Gates, Garage Doors, Fencing, Gates or Railings. 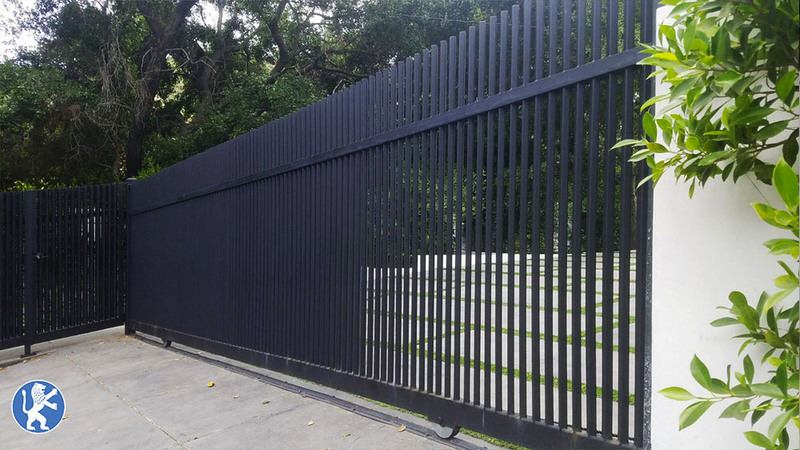 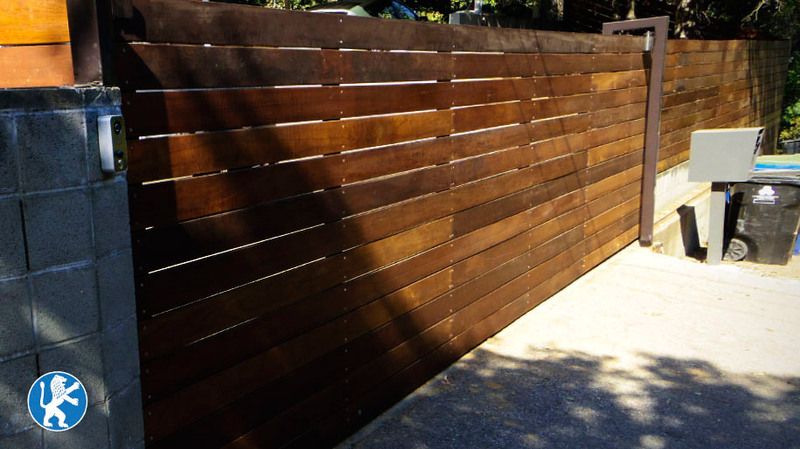 Classic yet modern fence. 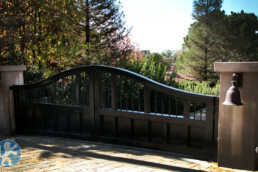 Iron frame with redwood in the center. 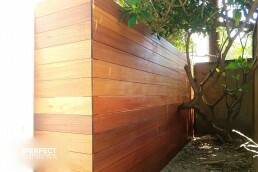 Completed in just one day from start to finish. 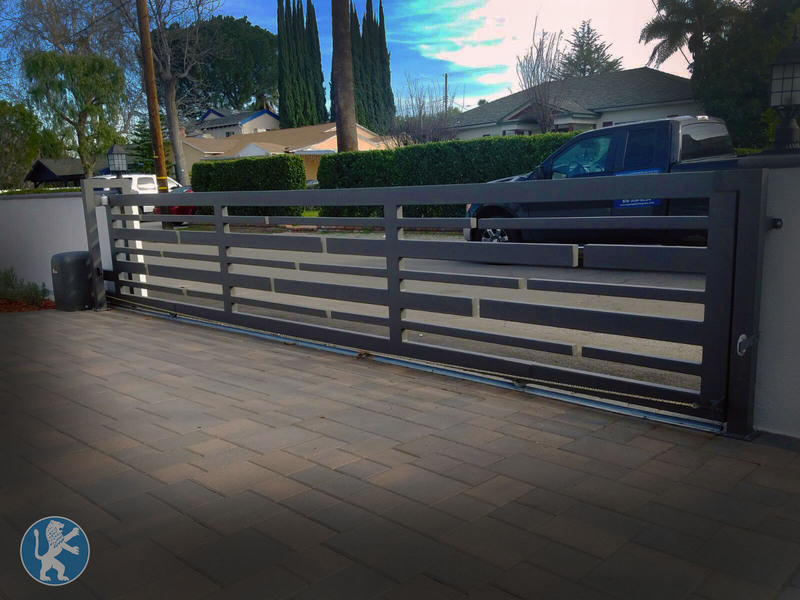 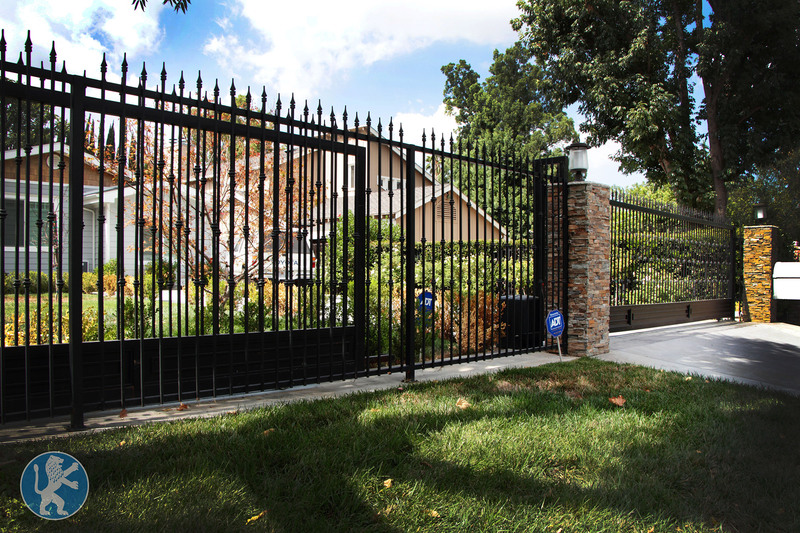 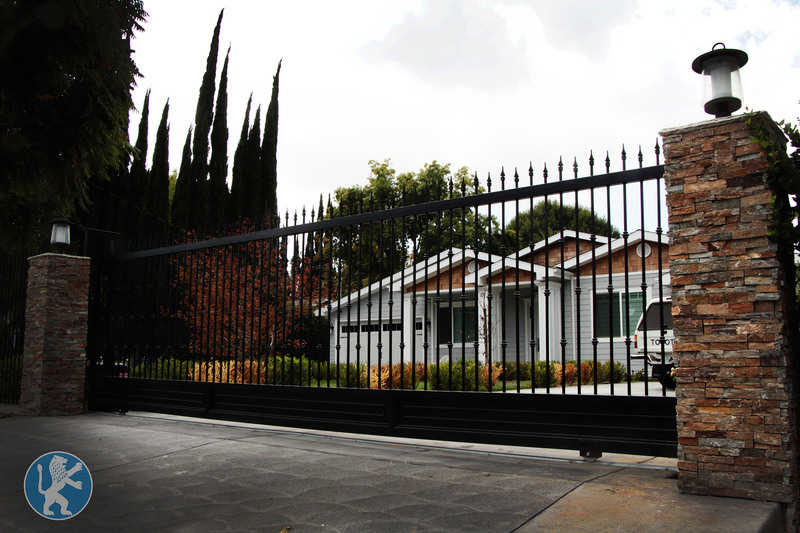 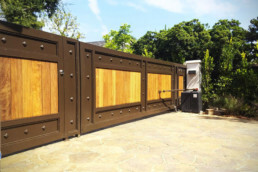 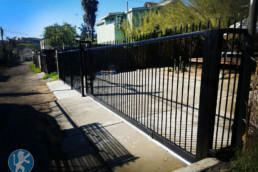 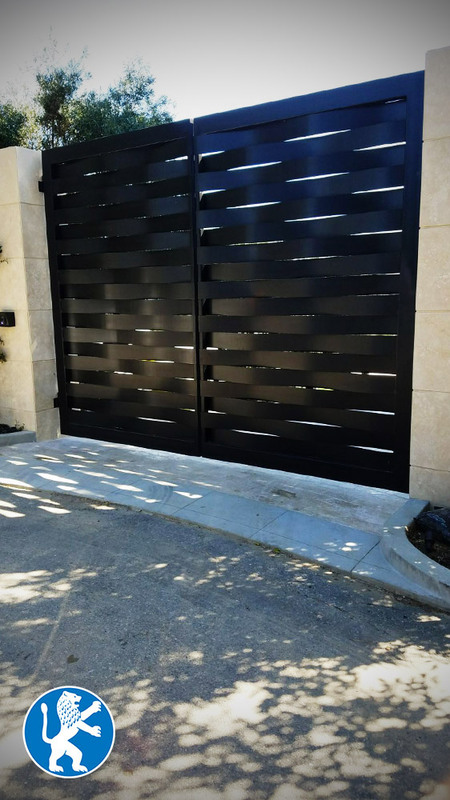 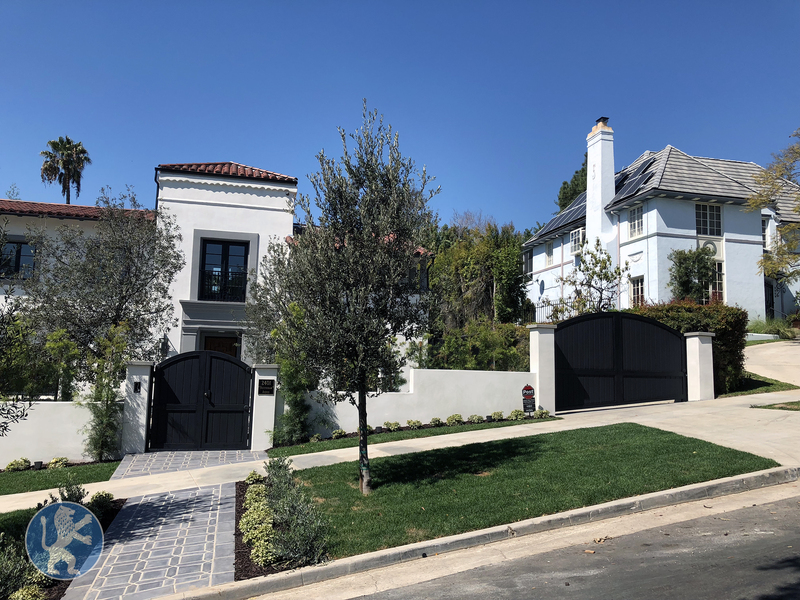 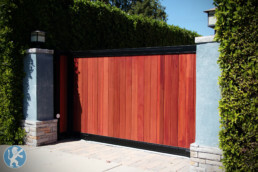 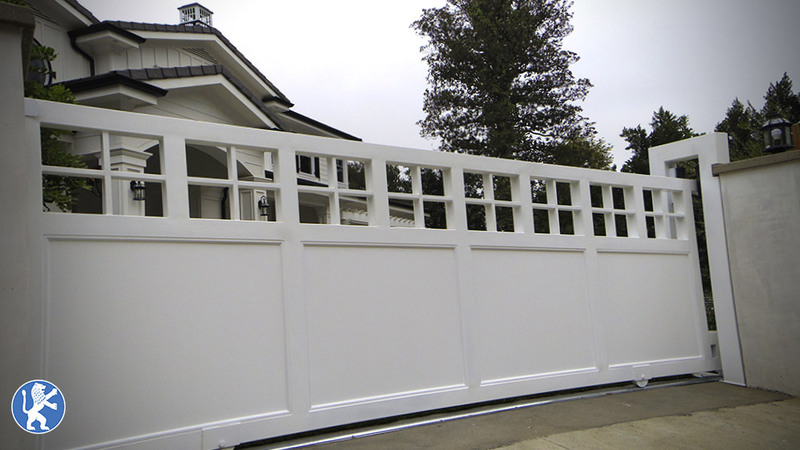 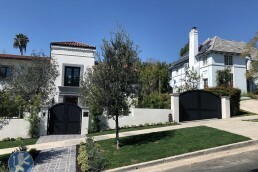 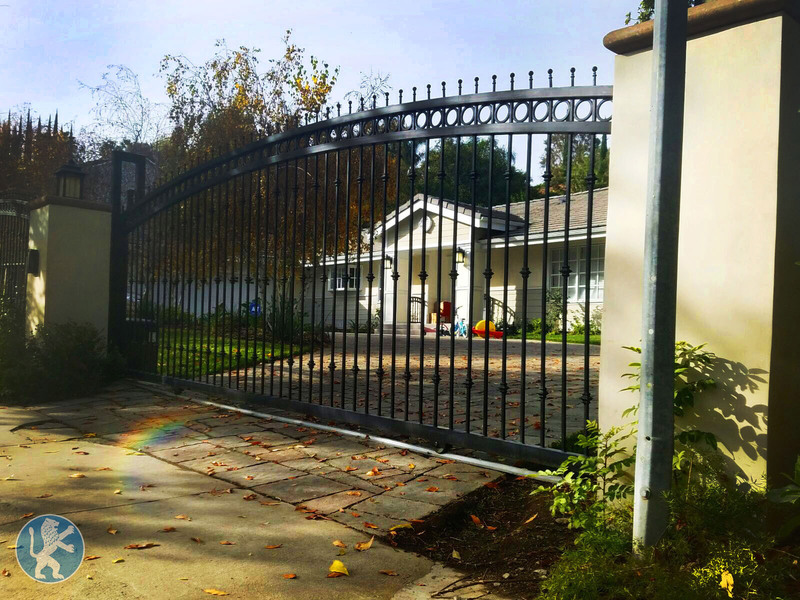 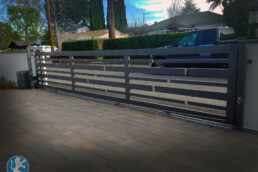 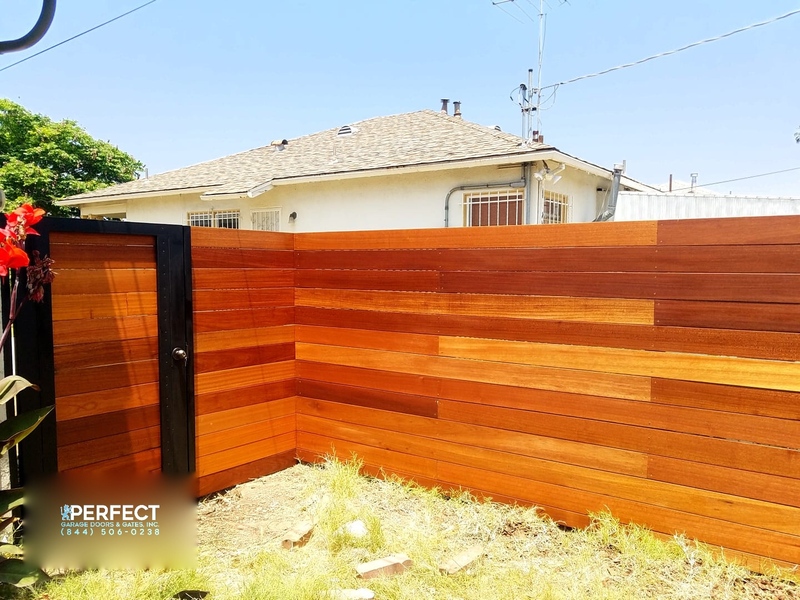 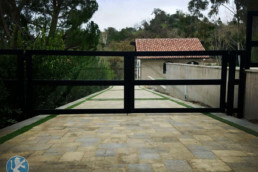 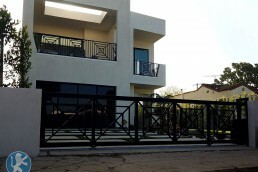 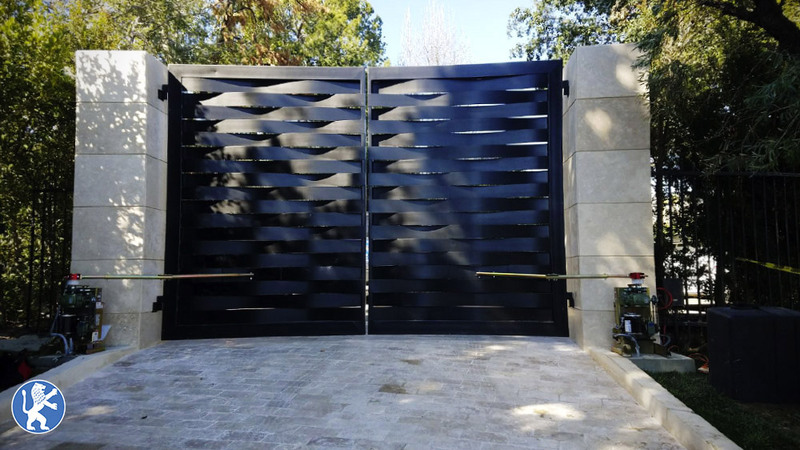 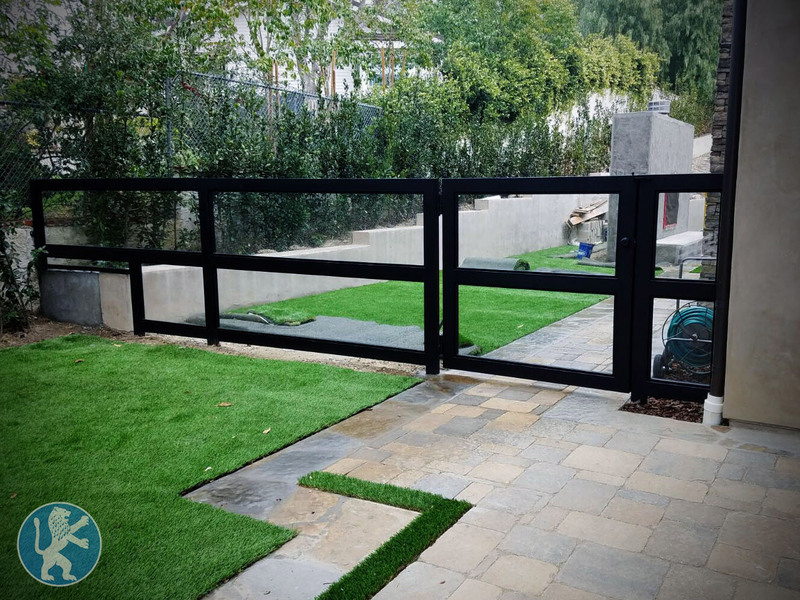 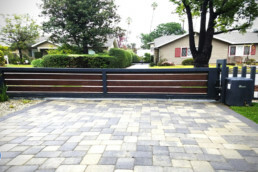 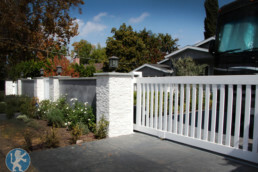 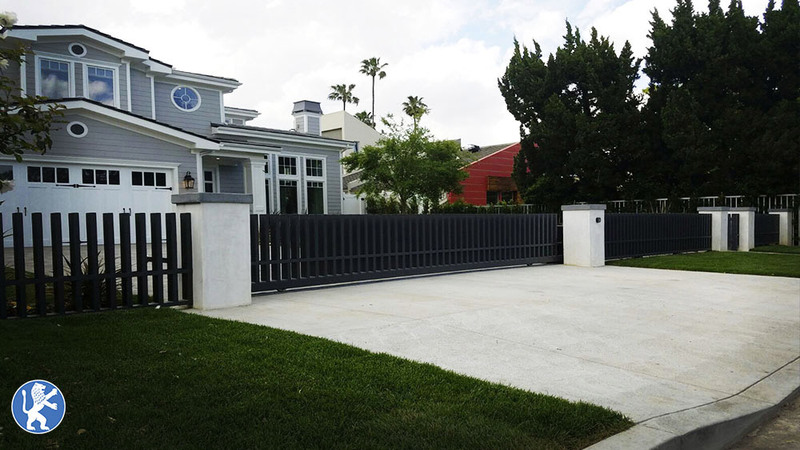 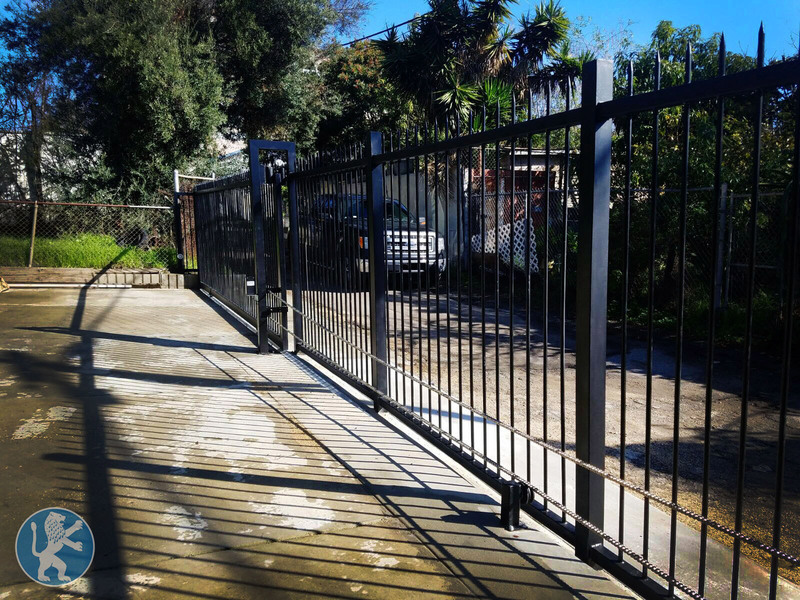 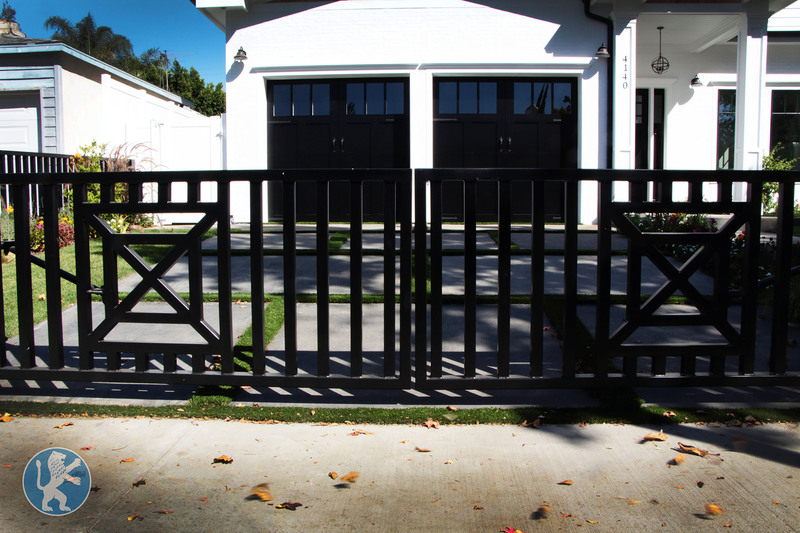 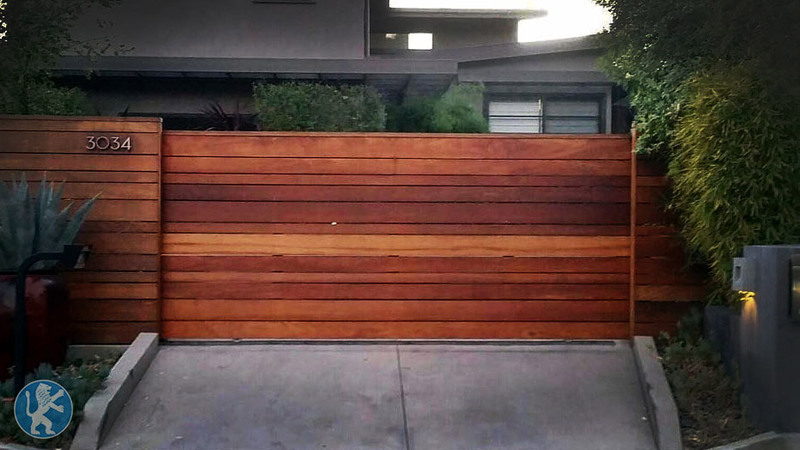 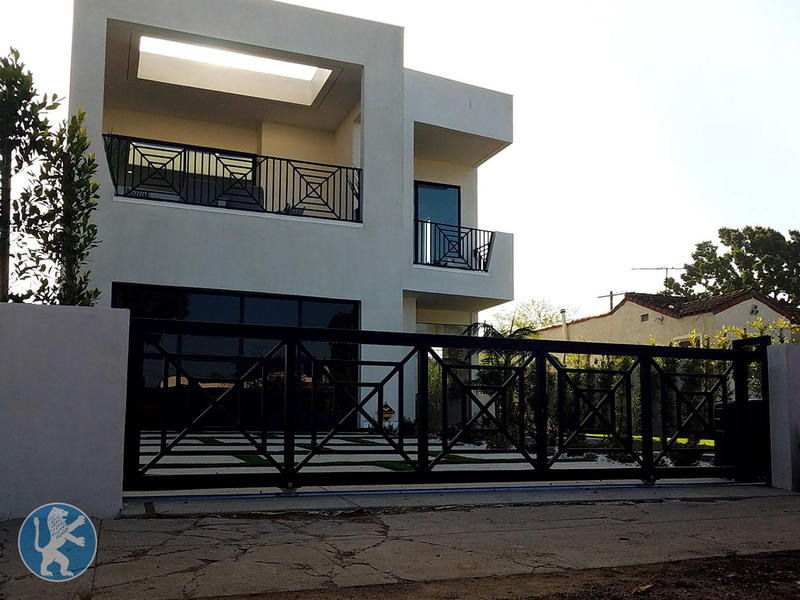 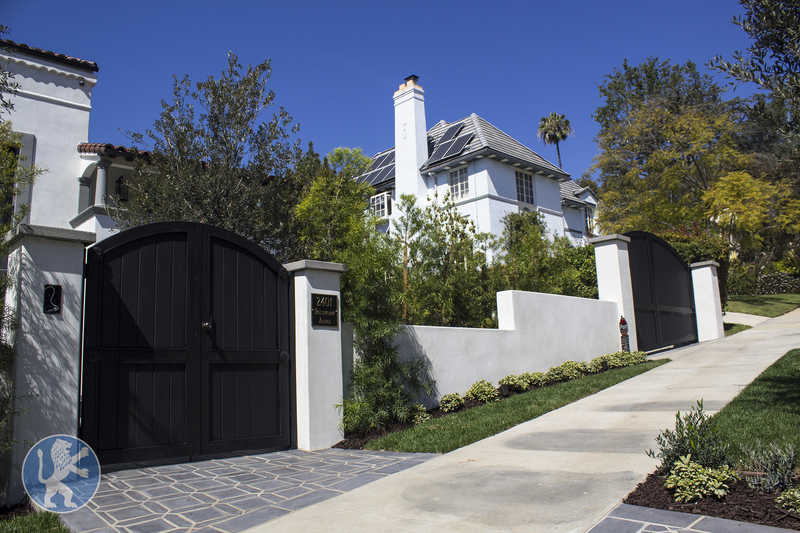 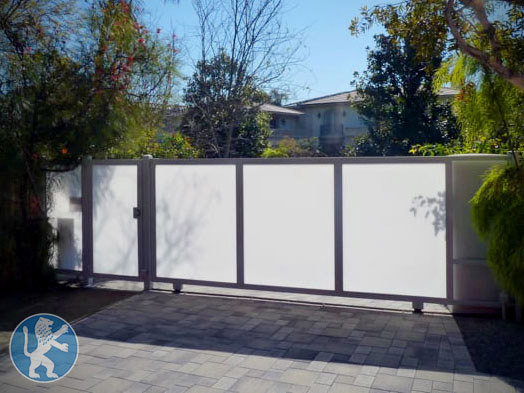 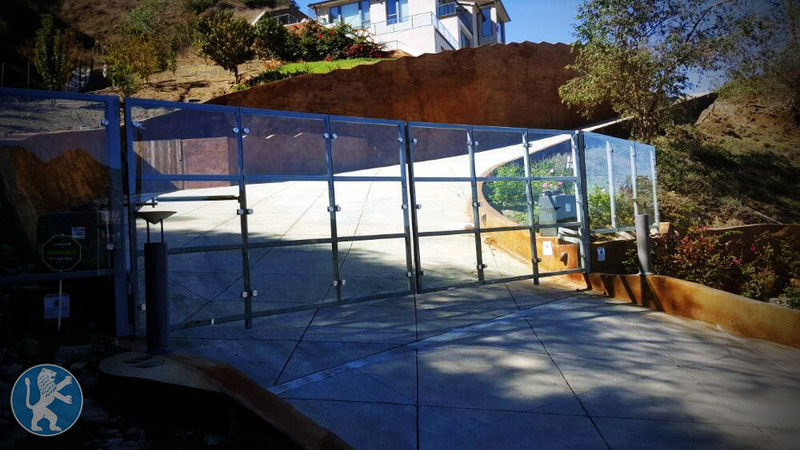 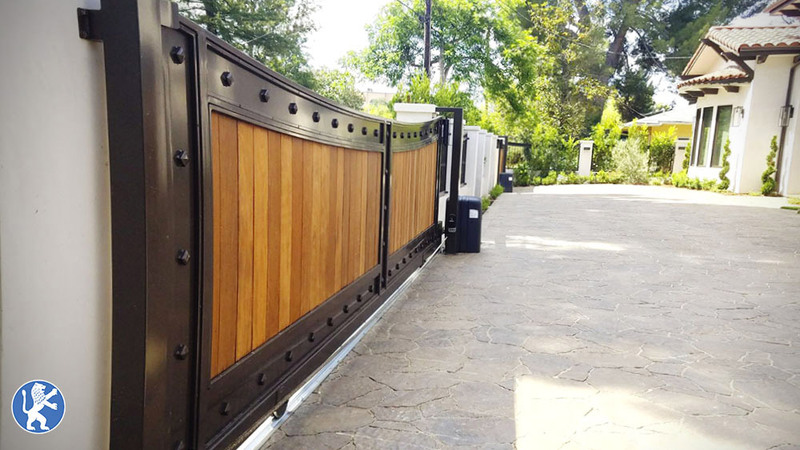 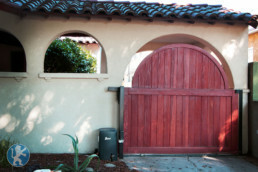 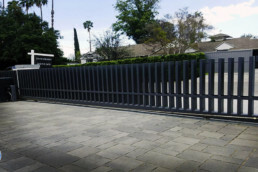 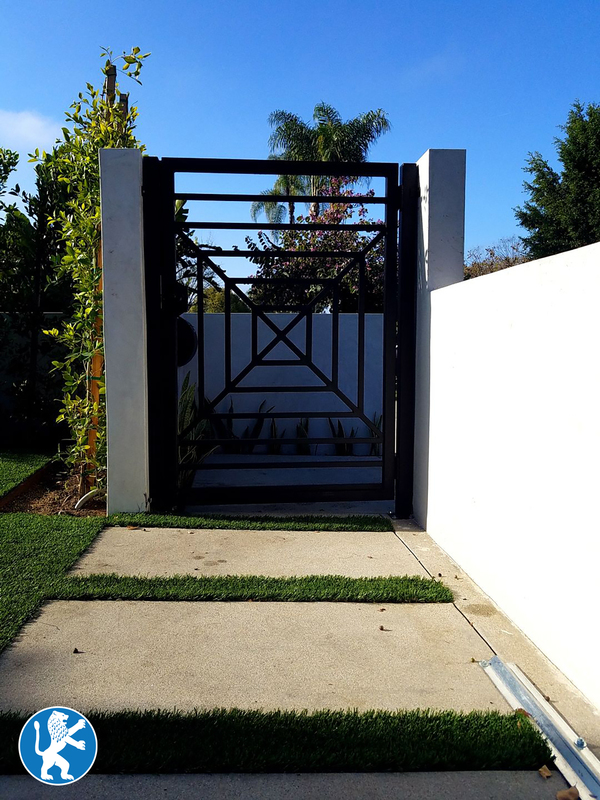 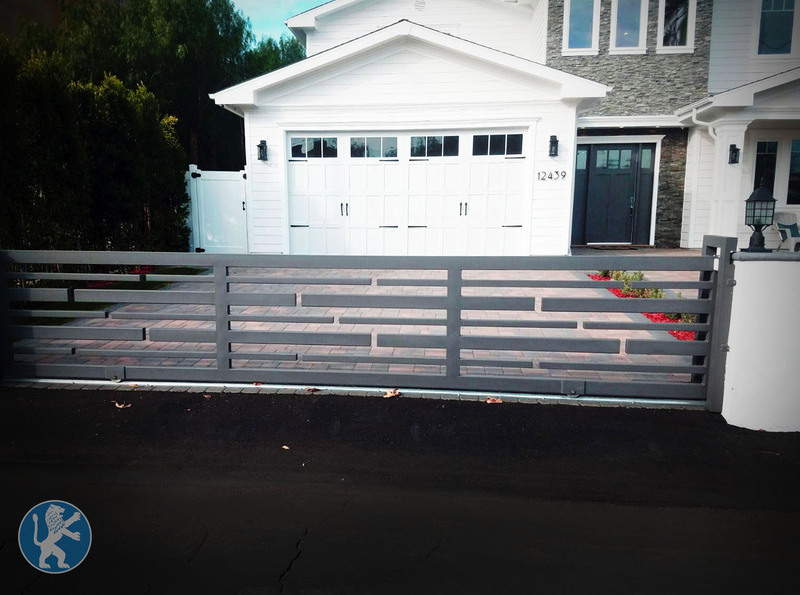 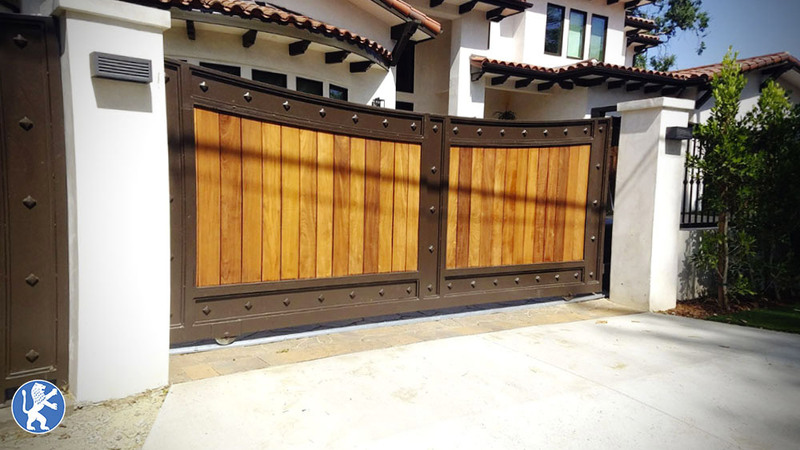 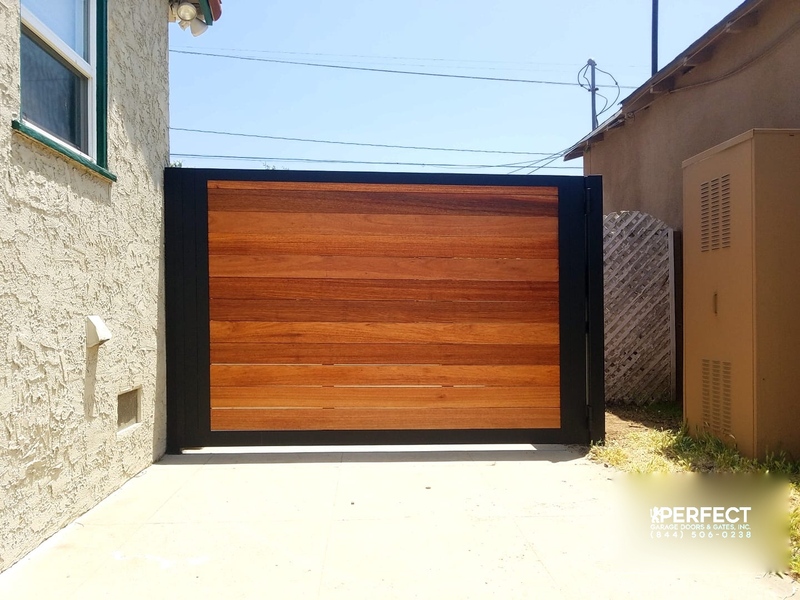 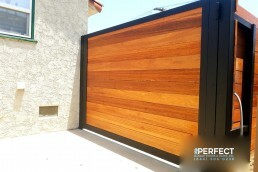 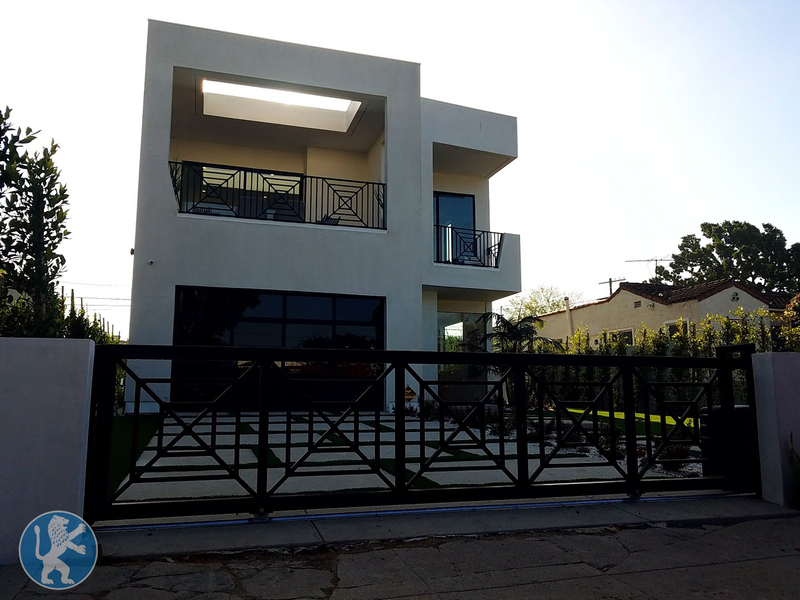 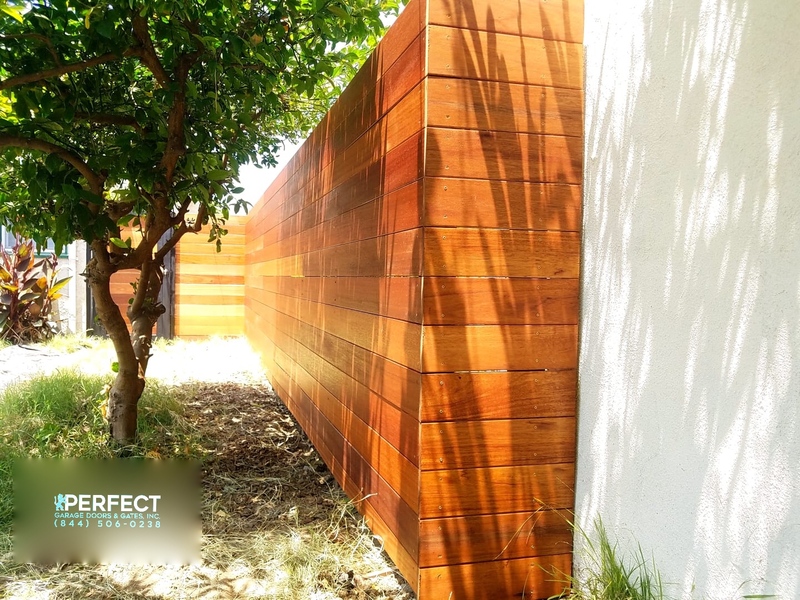 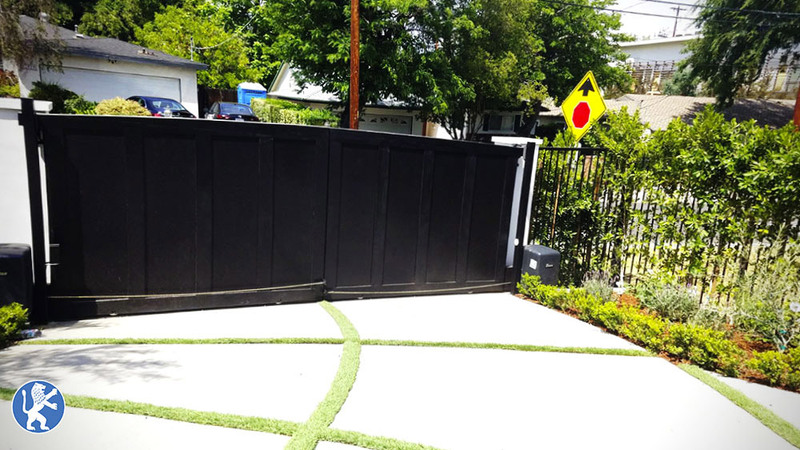 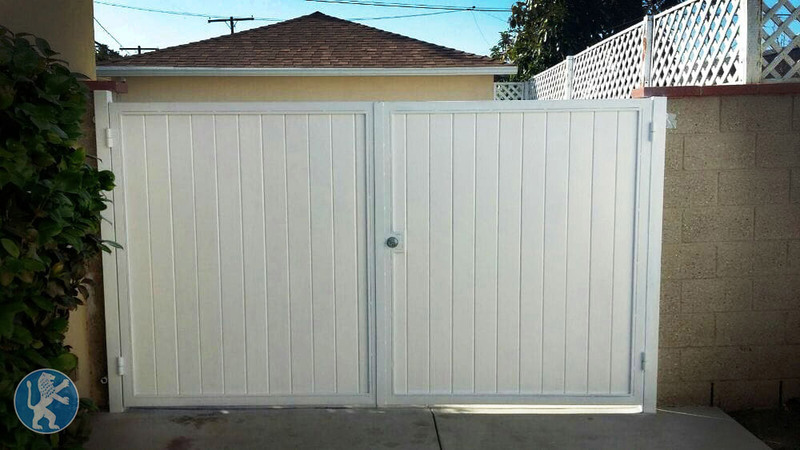 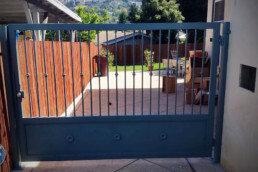 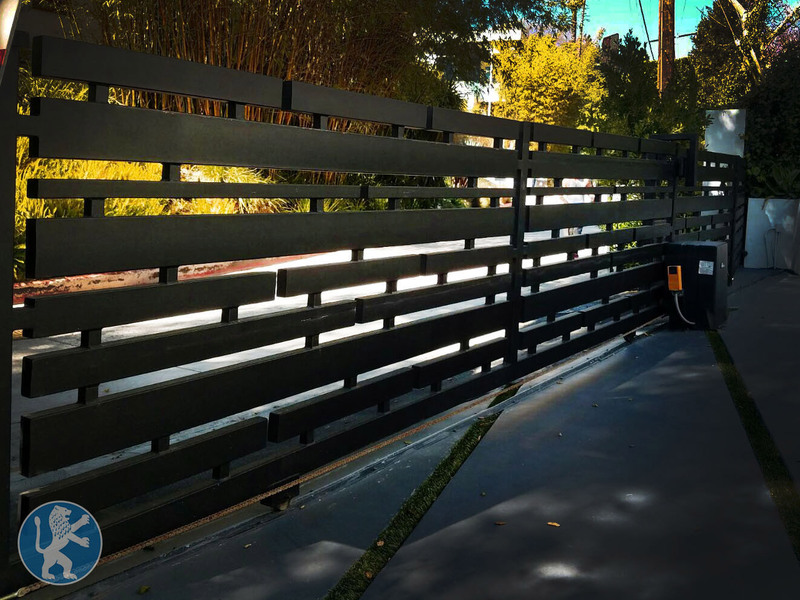 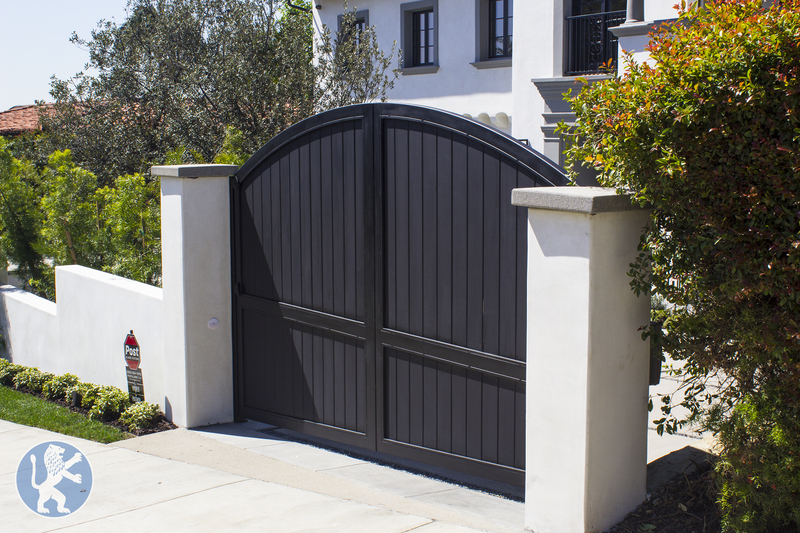 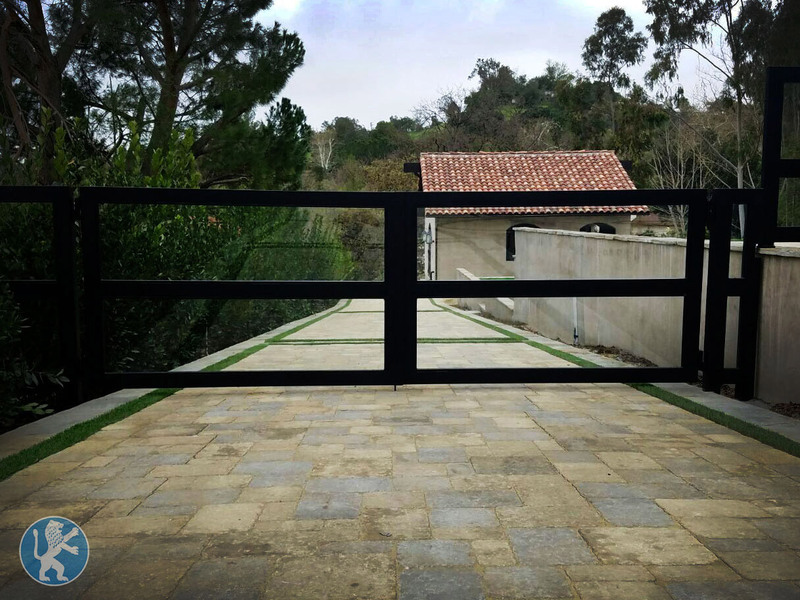 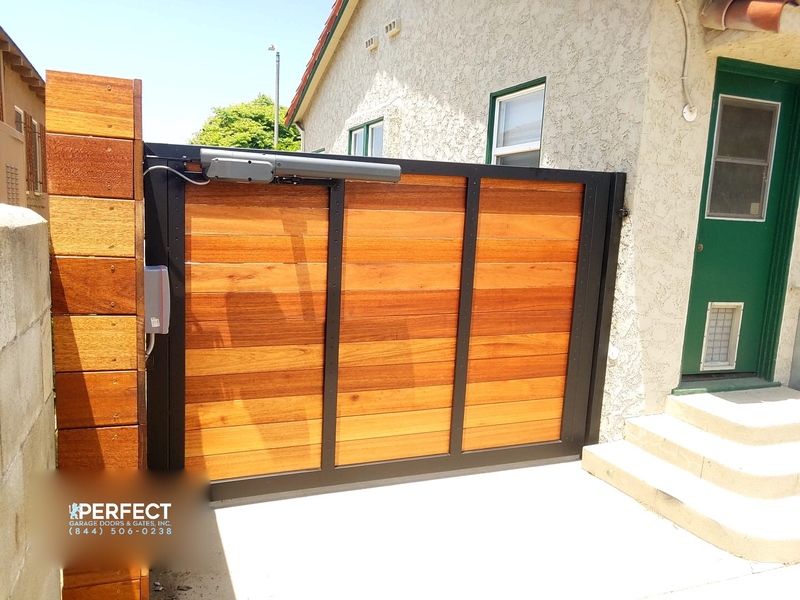 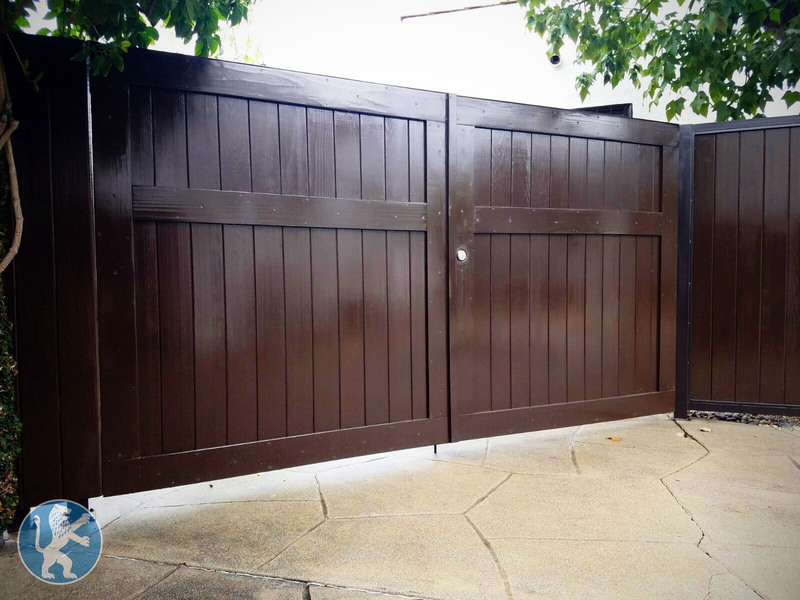 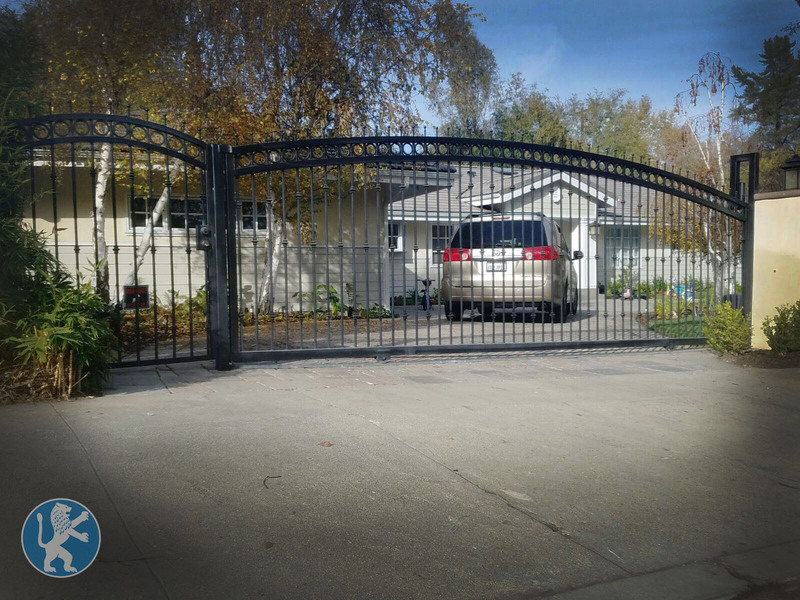 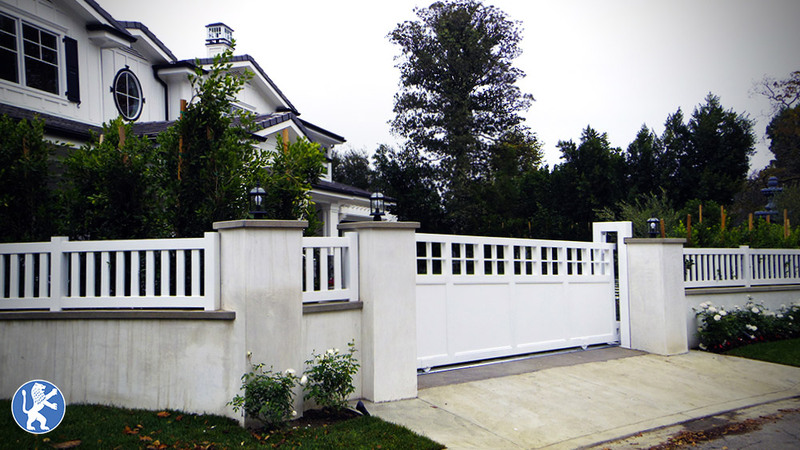 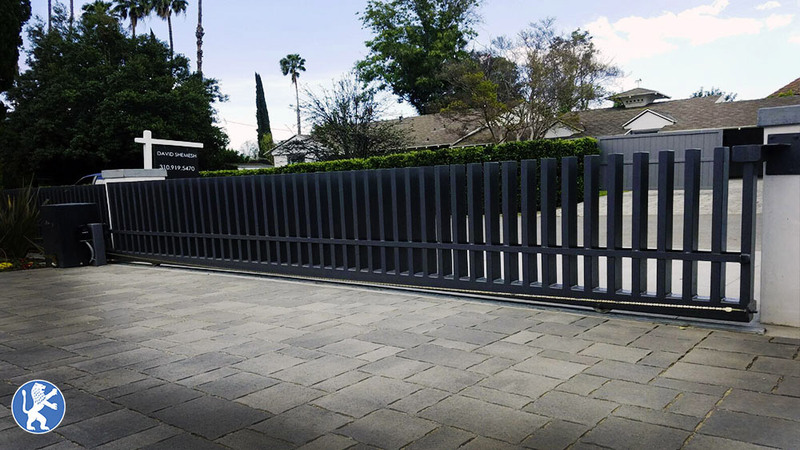 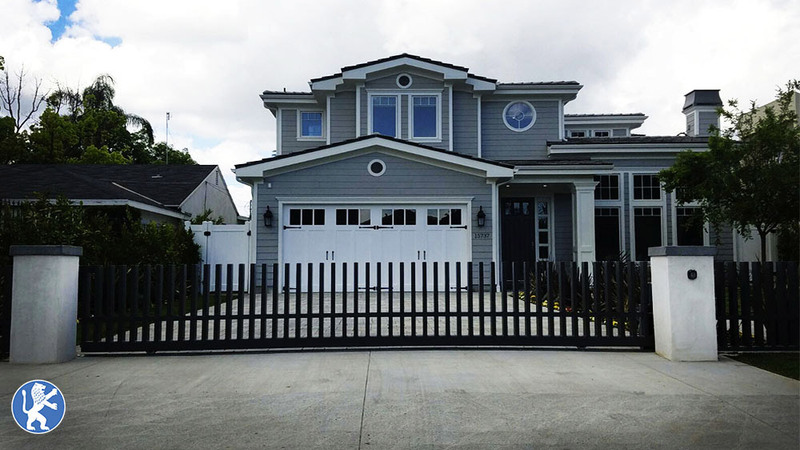 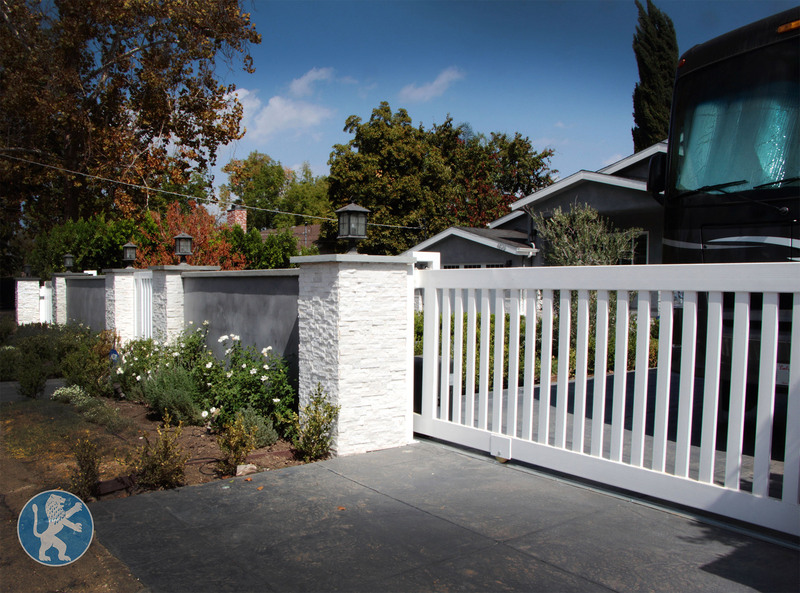 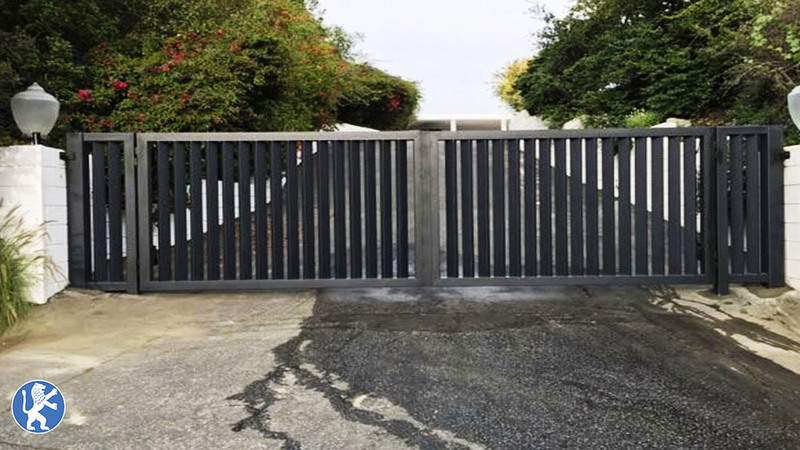 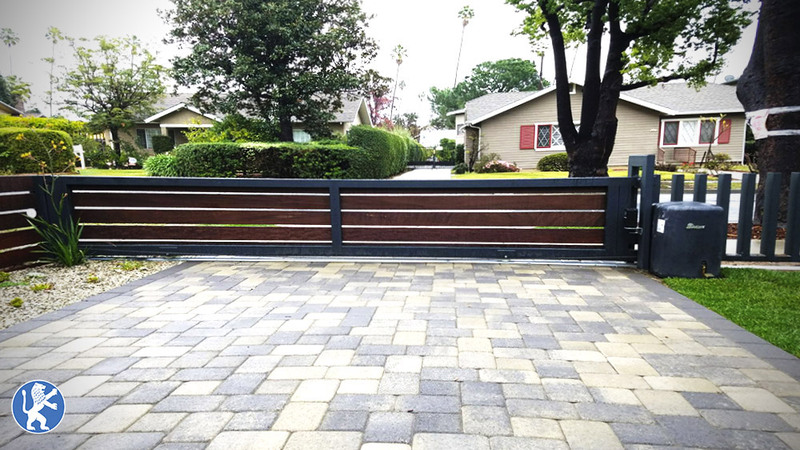 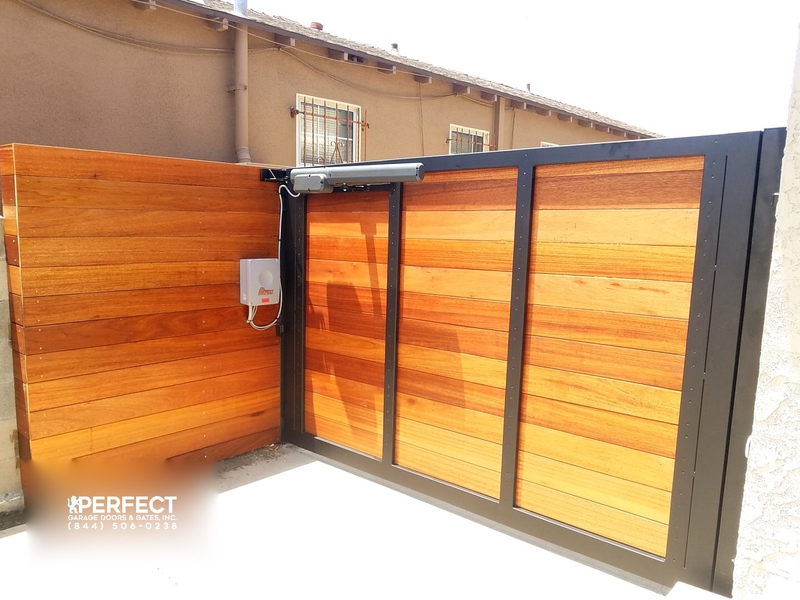 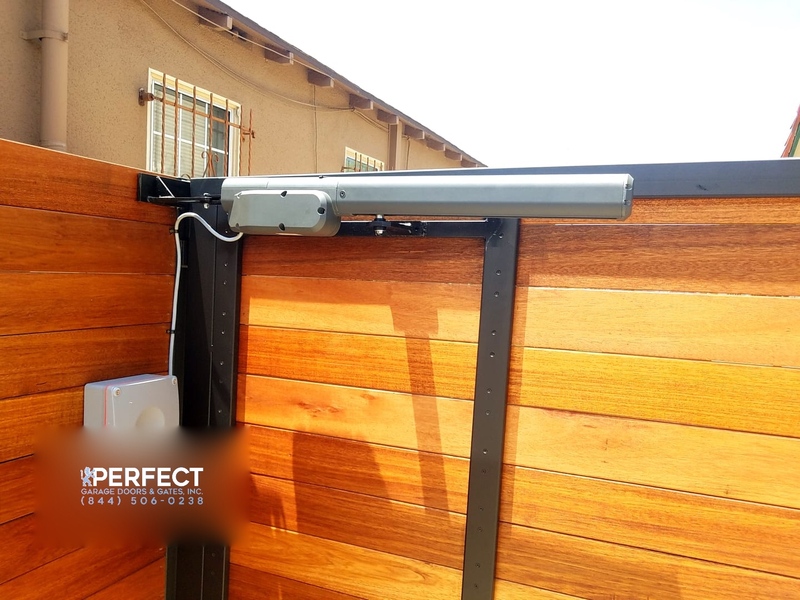 Perfect Garage Doors & Gates Inc., has been securing homes and raising property values for the last 10 years and have fabricated and installed security gates and fences for hundreds of Southern California’s families and businesses. 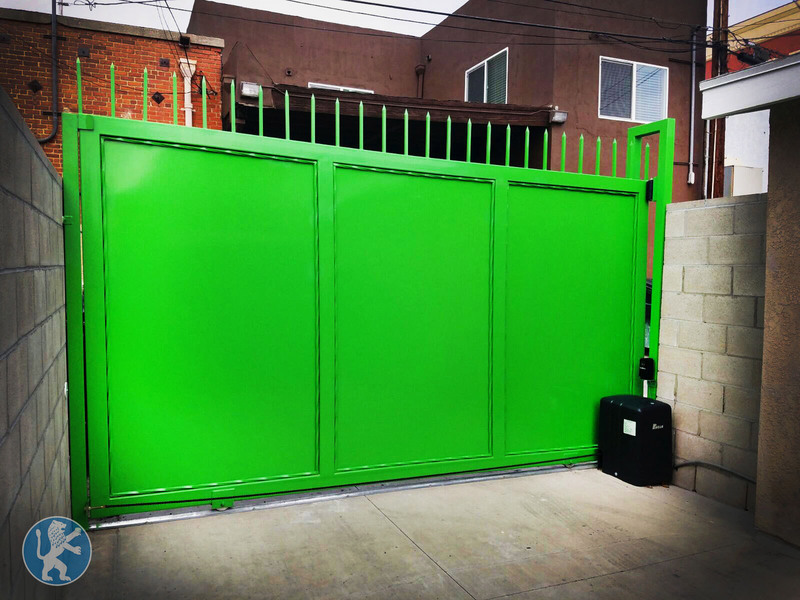 We have recently moved to our new offices in North Hollywood and have closed our doors at our previous location on Orange Ave. in Los Angeles. 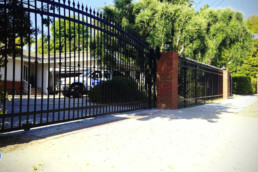 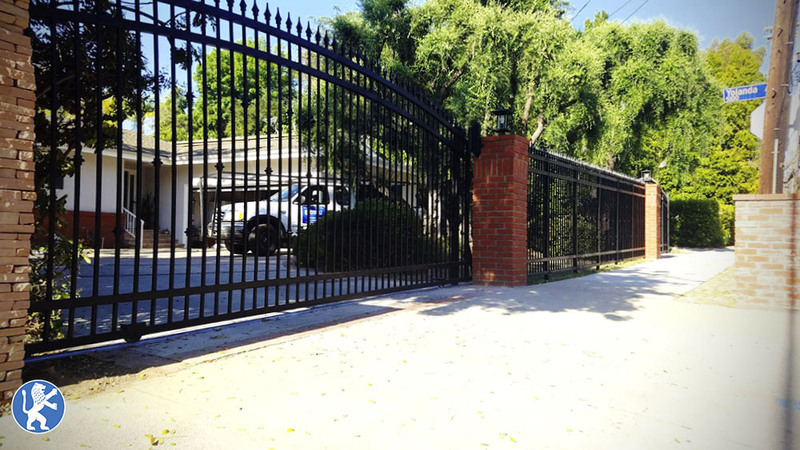 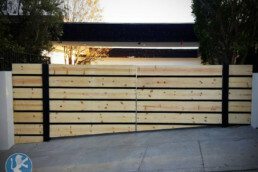 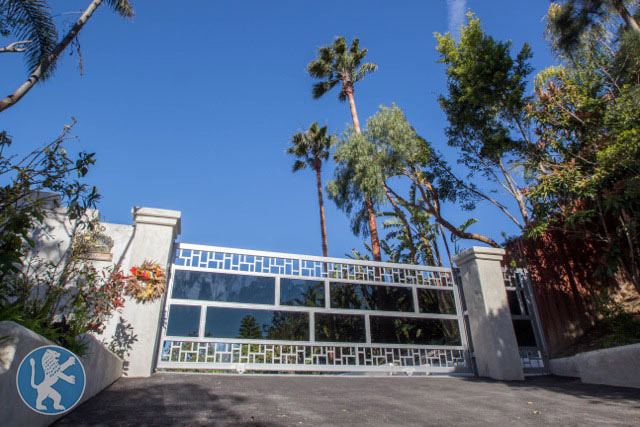 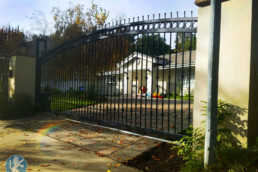 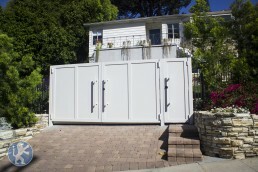 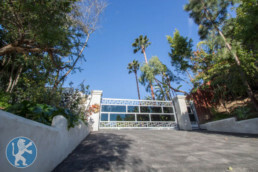 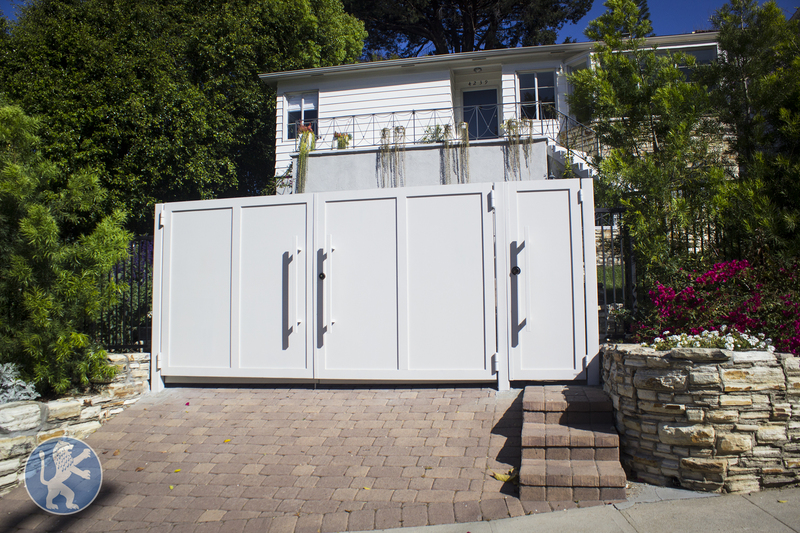 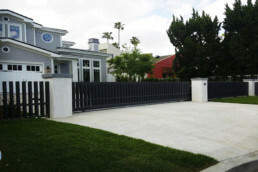 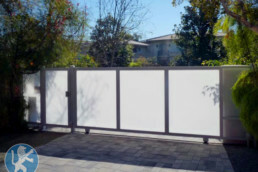 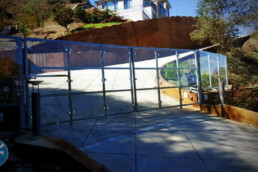 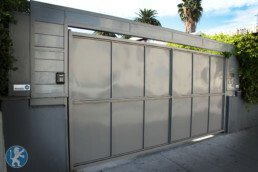 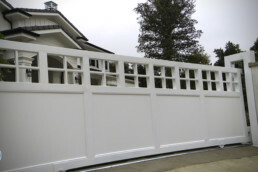 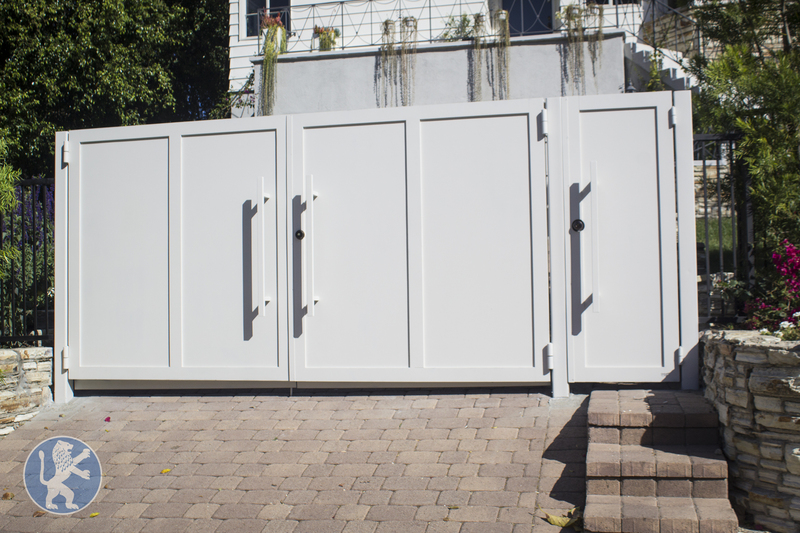 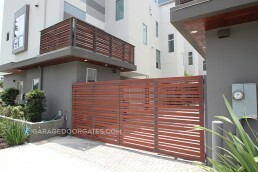 Perfect Garage Doors & Gates, Inc.
Our Other location at Orange Drive in Los Angeles is no longer open to the public. 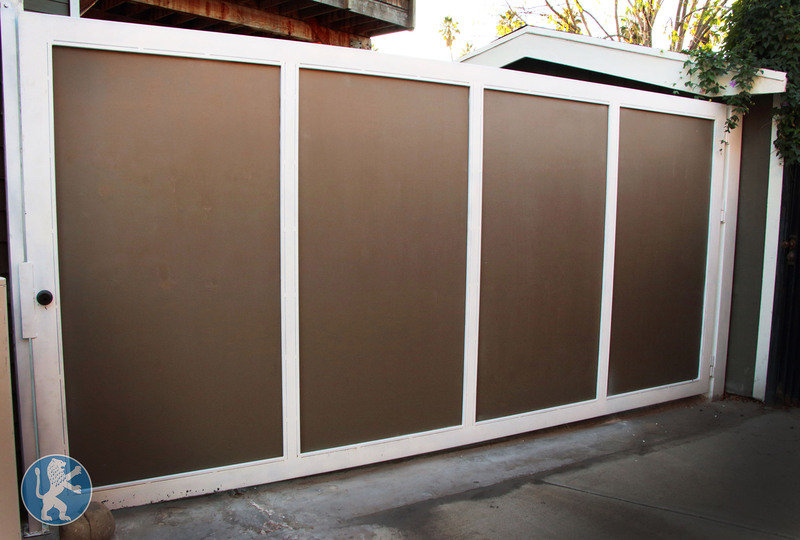 We do apologize for any inconvenience. Copyright 2014-2018 Perfect Garage Doors & Gates, Inc. | All Rights Reserved | Refund Policy | Website designed by: Perfect Garage Doors & Gates, Inc.